We hit the ground running after I posted on Saturday morning. I went down to help Bill while he staked off a huge section of the front yard so no one would drive on it. Basically, I only held the stake straight until Bill pounded it down into the ground. Then, I got called off the survey staking committee and Jill put me on chauffeur duty to pick up Jack from a Boys Scout event. It takes a village to do all the work on the compound. 🙂 Joan took Megan shopping at the school’s marketplace and shopping for birthday ideas. Jill cleaned house. Jim, Jim, Sr., and Bill did the staking for the house. We had to get everything done before Jack’s 2:30 football game. Not sure if you can see or not, but there are red survey flags in those piles of mud. 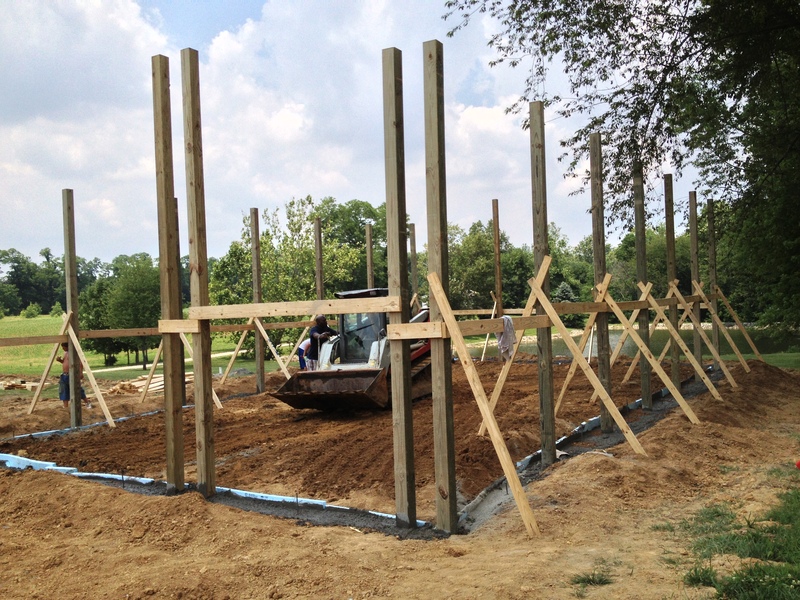 The flags mark the four outer corners of the house so the foundation guys can pour the footers in the right place. Sunday, I spent a lot of time measuring Jill’s fireplace and windows again. 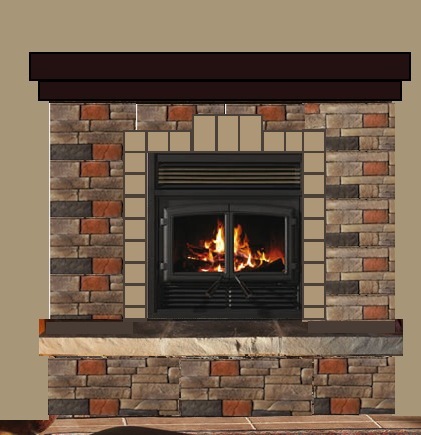 Unfortunately, when Bill and I discussed the window seats on each side of the fireplace and window and window seat measurements, we discovered we needed to make our fireplace larger than was drawn on our house plans! 😯 The fireplace and windows are gonna be the death of me yet! I was dreading breaking the news to Jim that we needed to make more changes. However, it is better to find out these mistakes before we start framing and before we order the windows. And, Bill and I looked again about how we would extend the fireplace stone up to the ceiling and it just wasn’t going to work either. Grrrr. We had a construction meeting with Jim on Sunday evening (Sept. 22). He gave us a lot of homework to do on Monday. The three of us each had our to-do lists. 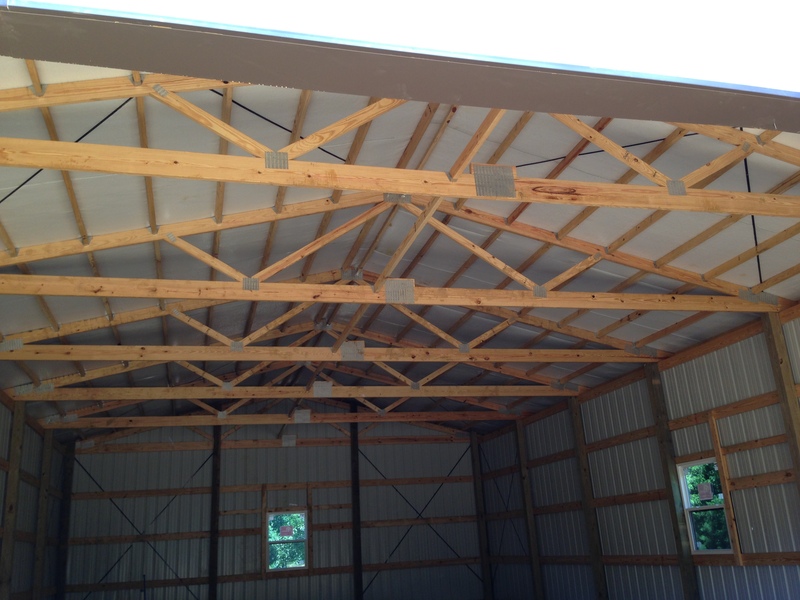 Jim worked with our vendor for Hardiboard siding and trim; updated house plans; made phone calls and arranged for permits; and lots of other behind the scene things he does – like discover that our bid for trusses was not for attic trusses. Bill arranged for a porta potty and dumpster; called another company to compare block prices; called vendor we planned to use for block material and had them resubmit their bid with updated information and arranged for them to deliver block on Wednesday; called another roofing material vendor and inquired about pricing; both of us visited vendor and picked out shingles and got a quote; called lumber company and had them resubmit their bid with attic trusses; ordered sand; and called Vectren to ask about electricity and gas hookups; cut our grass; moved the trailer to the side of the pole barn; arranged a hose hookup from Jim, Sr’s water-spout down by the lake; and found spots where the porta potty and dumpster could be stored during construction. Whew! He was a busy guy. 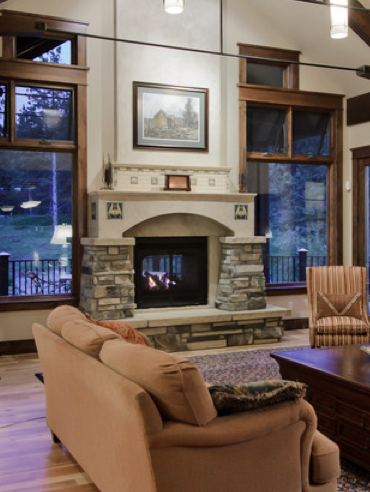 I had to re-work all our windows and re-design our fireplace. I also had my household chores of 5 loads of laundry, unloaded and loaded dishwasher, picked up kids from bus stop, wrapped Megan’s birthday gift, took Jack to football practice, and helped Jill prepare Megan’s birthday dinner. Jim, Bill and I shared lots of phone calls that day. 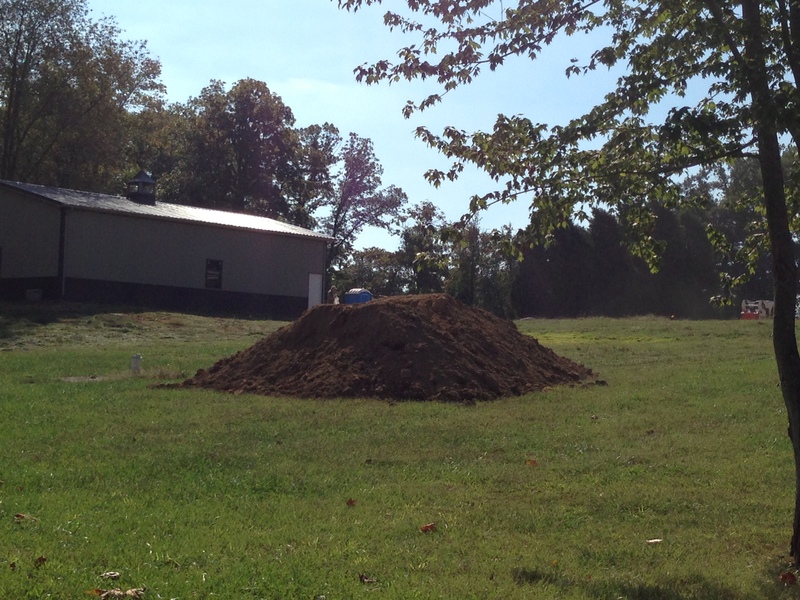 Jim found out that the Health Department said we needed to add more soil over the area where we were having the septic installed. 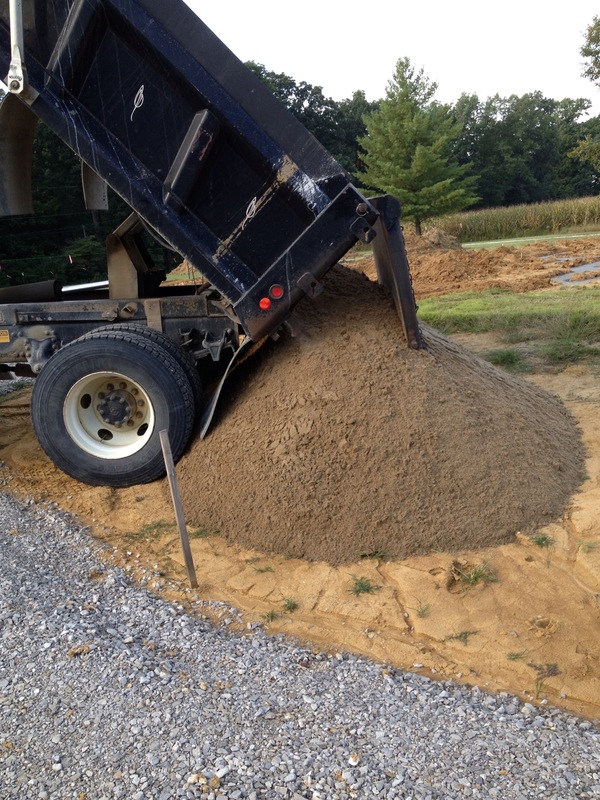 Saturday when we were talking with our septic installer (same guy who did our excavation for pole barn and our driveway and who will also be doing our final grading), he said he could get top soil for a cheap price per dump truck if we’d like it. Bill wanted to get a couple of loads for grading and had made arrangements for him to bring that on Monday. 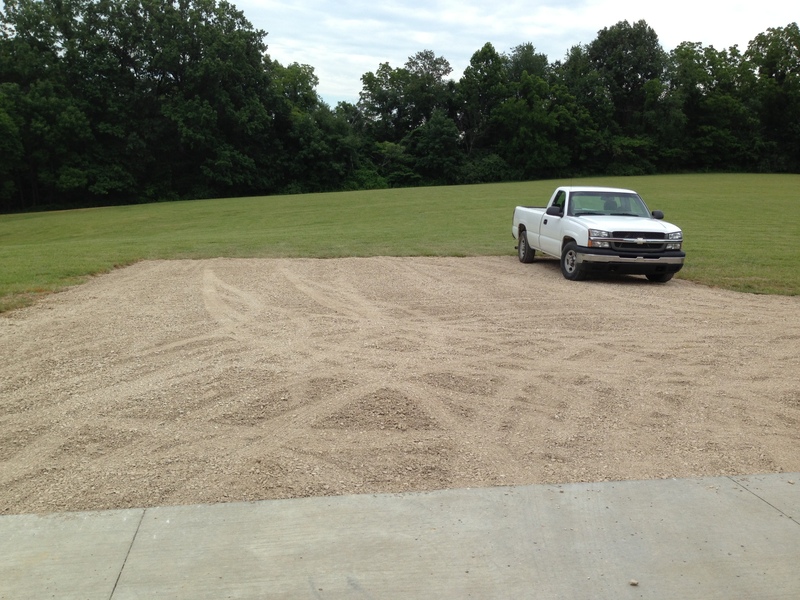 Well, when we found out we needed more soil for the front area, Jim told him to just bring it, too. I think we ended up with two loads in the back and four loads in the front. It’s really nice soil. While I was re-working the window schedule, I asked Bill if he thought our windows for the front bedrooms would be down too low. We measured everything again! I called the window guy and asked him what the next size window height down would be. We would have to go down from 56″ to 48″ in height. Where I loved the taller windows, I really wanted the tops of the windows and the doors to match across the exterior of the house. But, if I wanted to keep the 56″ height and still have them higher from the floor board, I would have to raise the top height. Again, Bill went outside to measure where that would take our windows. It ended up they would be up so high that they would be one board down from our trim board. That just wasn’t gonna look right. I ended up using our Home Architect 3D software again and changed all the window sizes to get a better look. Bill and I made the decision to go with 48″ heights in the bedrooms and in the laundry room. We left the two window seats at 56″ because those windows will be lower to the floor. Of course, then I had to call the window guy back and ask him to give us a new quote. Brother! I played with the fireplace and came up with a new design. Here’s what it might look like. By the time I left to go to water aerobics around 10:15, this guy was running this bobcat back and forth trying to smooth out the area where the footers would be dug and poured. It wasn’t long and the dumpster guy came to assess the area for the dumpster. Bill decided to put it to the right of the turnaround rock in pic below. The guy said it should be delivered sometime this week. I ran errands after water aerobics (even got my flu shot) and got home just in time to pick up the grandkids from the bus stop. Jill and Jim’s yard to the west of their driveway was lined with trucks and there was a wheeled digger with a backhoe digging those trenches for the footers. While I was parked at the end of the driveway waiting for the bus, some guy drove his car into the grass to the east of where I was sitting and sped around me and parked off the driveway near the construction. He slowly got out of his car and I noticed he was a big guy. Didn’t look like he was part of the construction crew to me. I mentioned him to Jim and Bill that evening and they weren’t sure who he was. It turns out he was probably the county concrete footing inspector cause we got an email the next day that he had been out and approved it. Yay! Bill held down the fort at the construction site and I took the grandkids up to the house. The foundation crew worked until about 5:00-5:30. Here are some photos of the afternoon adventures. Wednesday I went to bible study and ran more errands. Since we live out a ways, we try to combine our trips into town. Jill warned us that our gas bill would go up and it has! So, while I was gone, Bill had another busy day at the construction site. 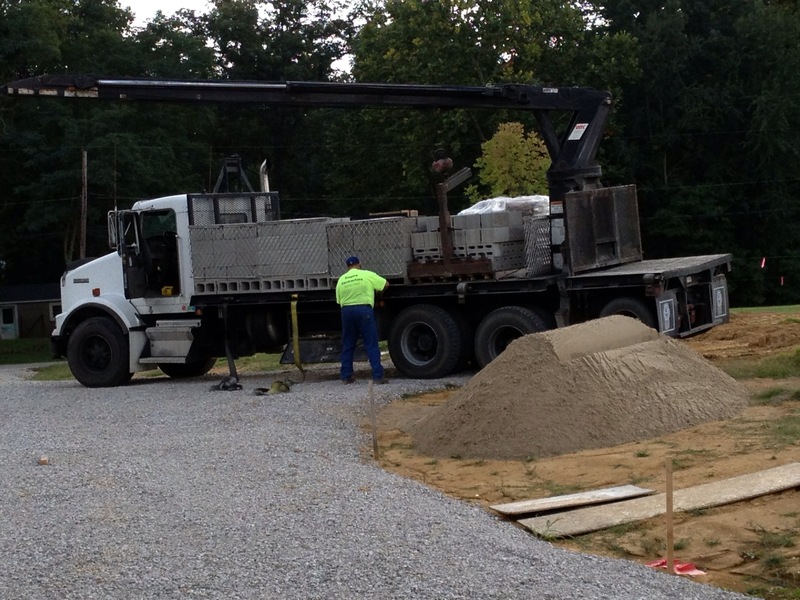 First up was the mortar sand delivery for the block installers. On Monday Bill had called the plumber to see if he needed to come out before the block guys came. So, he came Wednesday morning. 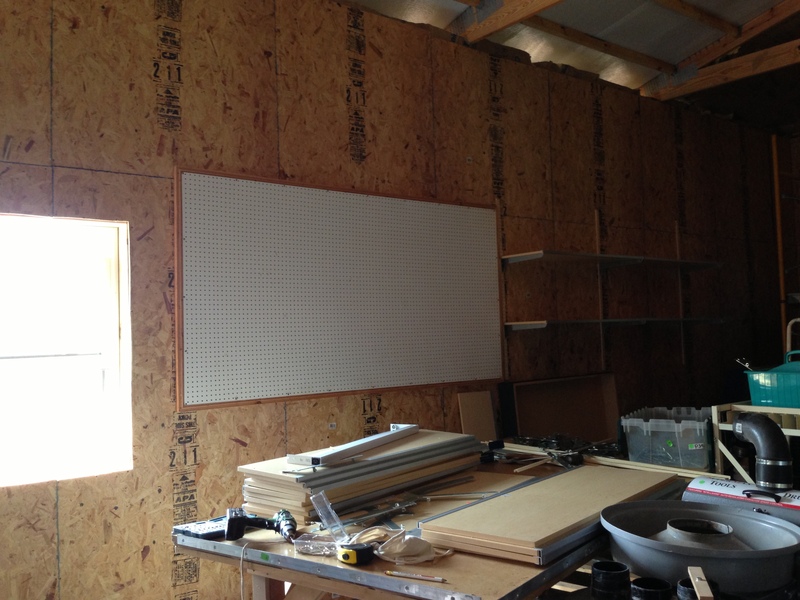 We had one plumber do the radiant heat and the rough-in for the half-bath in the pole barn. 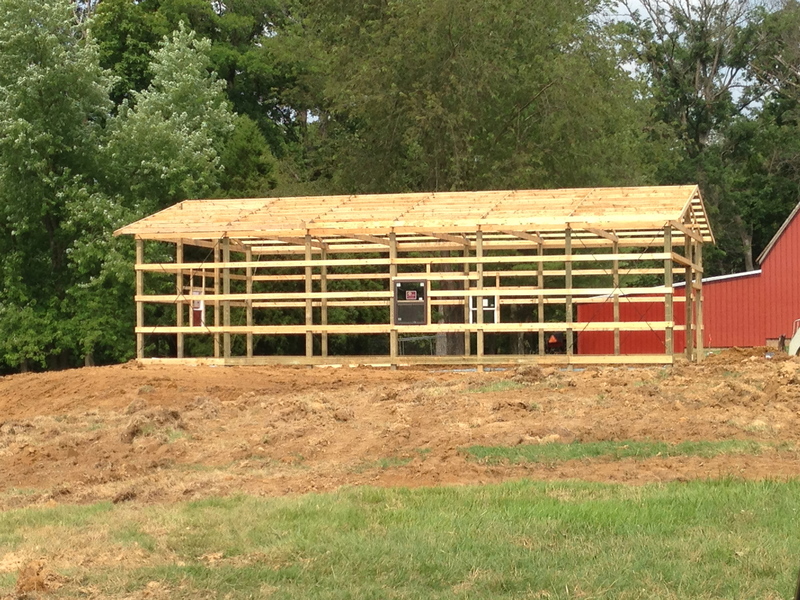 We were using another plumber for the house and the completion of the pole barn stuff. It appears that the first plumber may not have roughed-in the half-bath the way the second plumber would have liked it. 😳 We hope he can come up with a remedy. What we do know is that we cannot use the toilet that Jim’s parents were giving us. And, there’s something about a grinder pump thing-a-ma-jig. The plumber also put some pipes down to approximate areas where he would need plumbing access. Bill said the block guys would put them in the proper place. Vectren came out in the early afternoon to assess the situation for temporary and permanent electrical service. The gas guy called Bill earlier in the day and said instead of him coming out, he would just get with the electric guy afterwards. Bill talked to him about transformers and whether we need one now or later. We will need a new one on the pole at the end of our driveway. They talked about if we wanted temporary electric we could run it from Jim & Jill’s transformer at the end of their driveway. But, they would have to go up 18 feet for the wires to be pulled over and Bill said that wouldn’t work with the large trucks coming in and out. If we put a transformer on our pole now, it would be a 200 amp one. However, since the house will be 400 amp, we’d have to have another transformer installed when the permanent service was needed. The Vectren guy told Bill he needed to call Vectren marketing and get a price for what the transformers might cost. 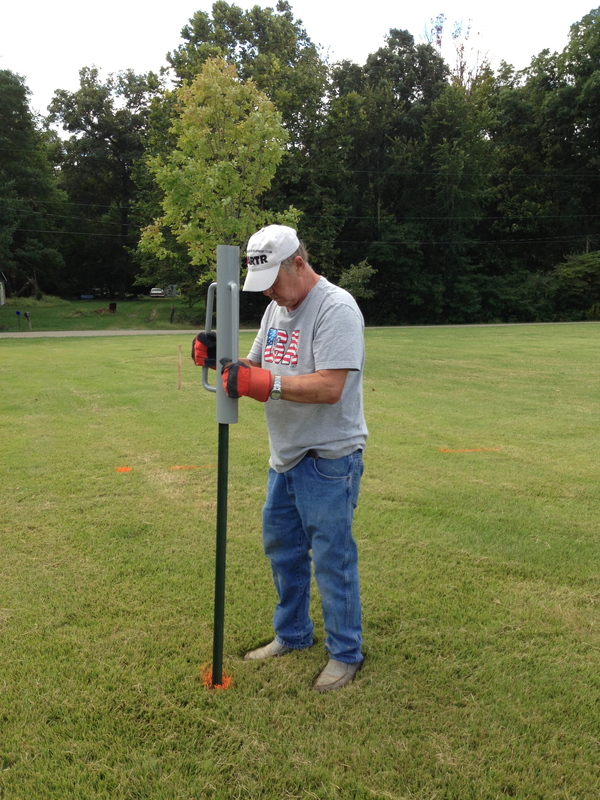 We also will need to fill out a form with a checklist of any possible equipment in the house and pole barn that we might be running in the future. They have some sort of 3-year deal where they assess what revenue will be generated on what you will use and that is what they base the cost of how much we’ll pay for the transformer. Sounds complicated to me! 🙄 Anyway, the Vectren guy left Bill a voice-mail message late yesterday that they could get us temporary electrical service by January 2014! 😯 That’s not gonna work. Bill will be calling the Vectren guy back today. The block delivery arrived around 2:00. Today someone from the foundation crew will be back to remove all the ground around the footers to make the ground level with the footers. You can see from the pic below what I’m talking about. 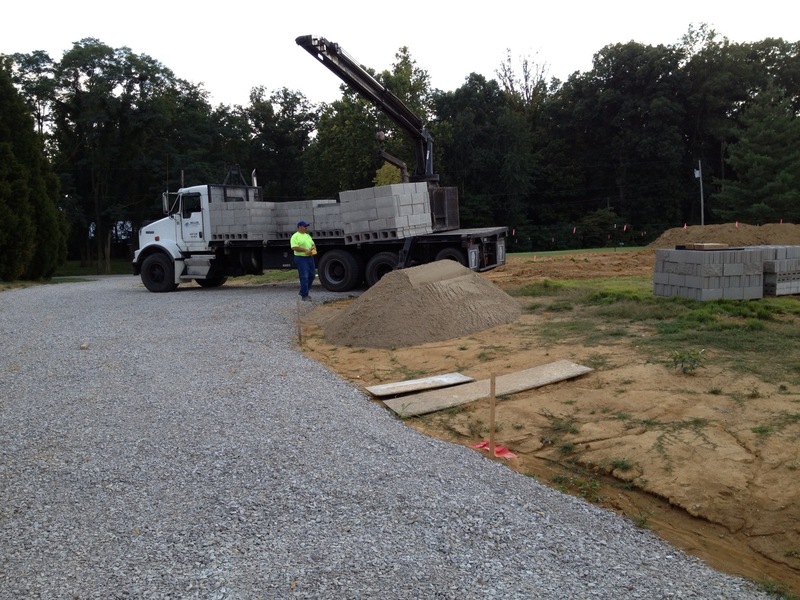 The block installers are scheduled to arrive Friday to install our block. When Jim started to call subs over the weekend to schedule them he found out our framer would not be available for another 3 weeks! He checked on our second choice framer and he was 4-5 weeks out from being available. So, we are going to wait for our first choice guy. Actually, I’m kind of glad we will have a delay because I’m taking a trip and I don’t want to miss the framing of our house. I want a front-row seat. Don’t get me wrong, the footers and block are exciting! However, I think the framing is the best part in the beginning. It finally brings all these months and years of planning from a flat or 3D rendering to an actual structure that we can stand in and walk through. It is Bill’s hope that he will be able to start working on cabinets in the next two weeks. There’s really not much happening with the house-building. Still waiting to hear from the builder. Actually, other than playing the waiting game, it’s been quiet on the home front. And, Bill and I aren’t worrying about it because . . . Remember when I told you last time that they were installing the cupola on Monday, July 15? Well, it didn’t happen. 😦 Oh, they came for a short time Monday morning and put together the cupola. Turns out there were some parts missing and had to be ordered. They are supposed to come back tomorrow (Monday, July 22) to install it. We’ll see. 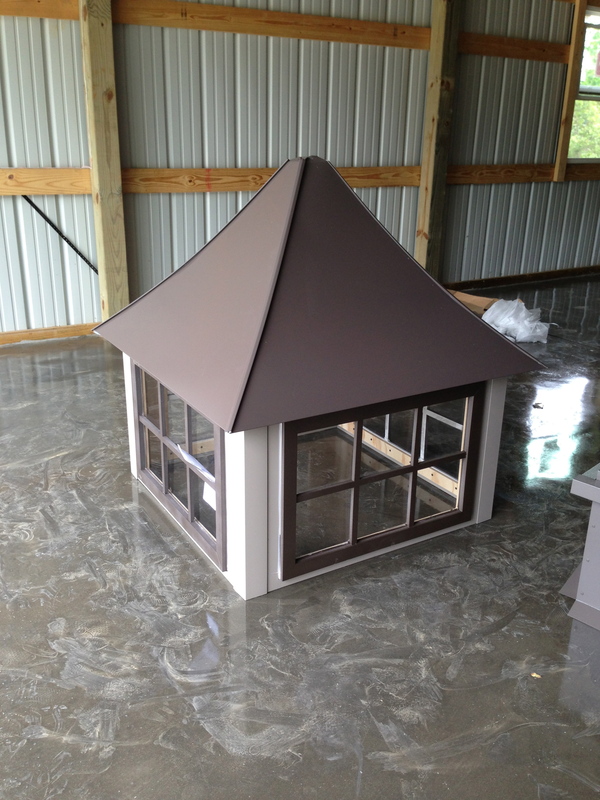 Here are some pictures of the cupola. Base which fits over the ridge on the roof of the barn. Then cupola attaches to the base. 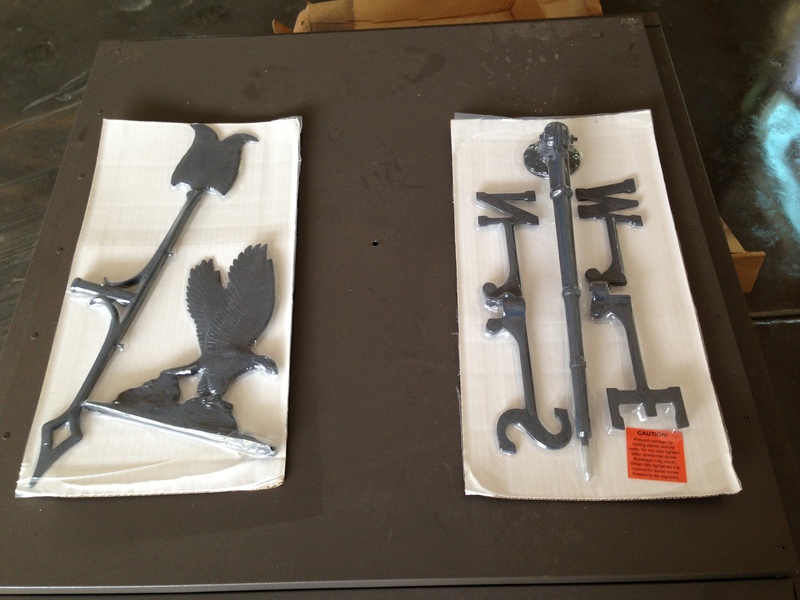 Eagle weather vane which will go on top of the cupola. To give you a little perspective of how huge this cupola is, here is a picture of me standing next to it. It was a lot larger than we thought it would be. Maybe that’s why it cost so much! But, it’s so cute! Don’t you think? 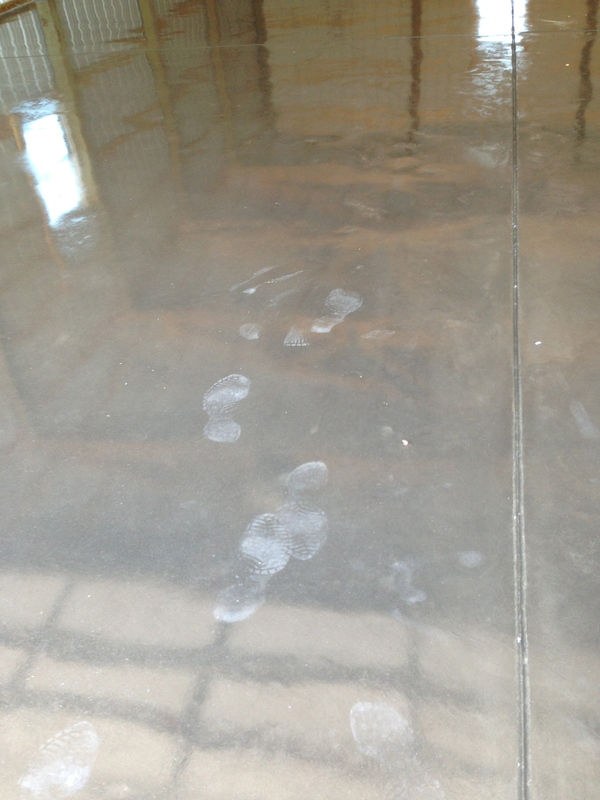 And remember those few footprints last week on that new shiny pole barn floor. Look at all those prints now! I sent this pic to our son Bryan this week via text and he replied he could barely see the cupola because of all the footprints. 😆 He’s such a funny guy! Bill has worked in the pole barn a little this week, but we’ve been in the middle of a heat wave and it was hot in that barn. He was able to caulk all around the interior. He said in his last pole barn he could always feel air coming through those same areas in the winter. He was determined to cut as much loss of heat as possible. When I changed our address with the post office before we moved we received several 10% off Lowe’s coupons. Each one had a different expiration date. Bill was able to save money on all his caulking material for the first coupon. The second coupon expired Thursday. He made another trip to Lowe’s and bought all his 2×4’s and other wood to start putting up his wall studs. Now that Bill has access to electricity, he needed some relief from the heat. 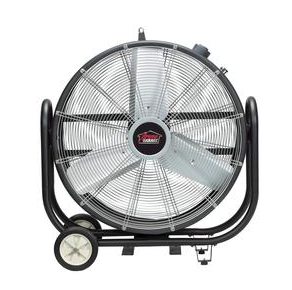 Today we went to Menards and he bought this 30″ commercial-grade pivoting drum fan. This should help! 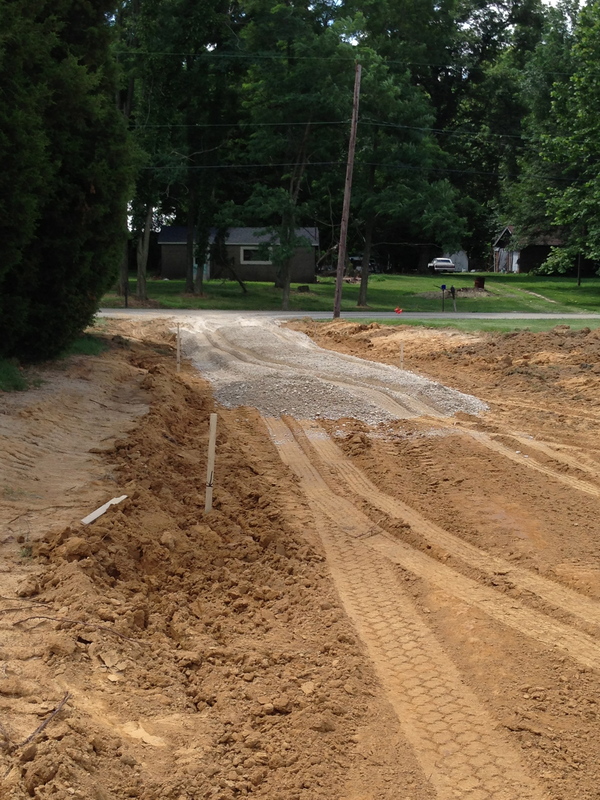 Yesterday the excavator came up to Jill and Jim’s house and extended their driveway to create additional parking spaces. Since Bill and I brought two more vehicles up here in addition to the Gator (which has found its home in Jim’s garage bay), we felt we would offer to create this additional parking space for J&J. Hey, they are providing us with a free home for many months. We felt this was a win-win for both of us. The new area came out really nice. 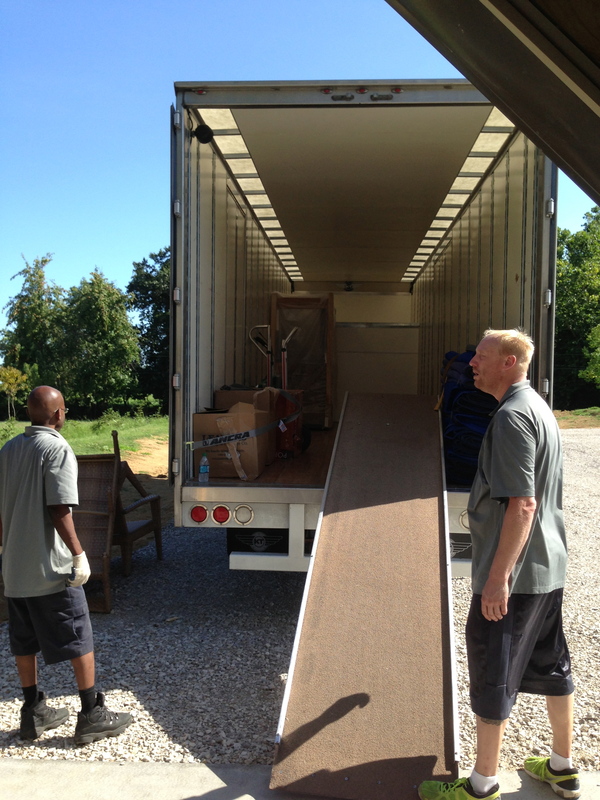 The new area is about the length of the truck. But the excavator spread the new rock over all the top area so it all looks new. 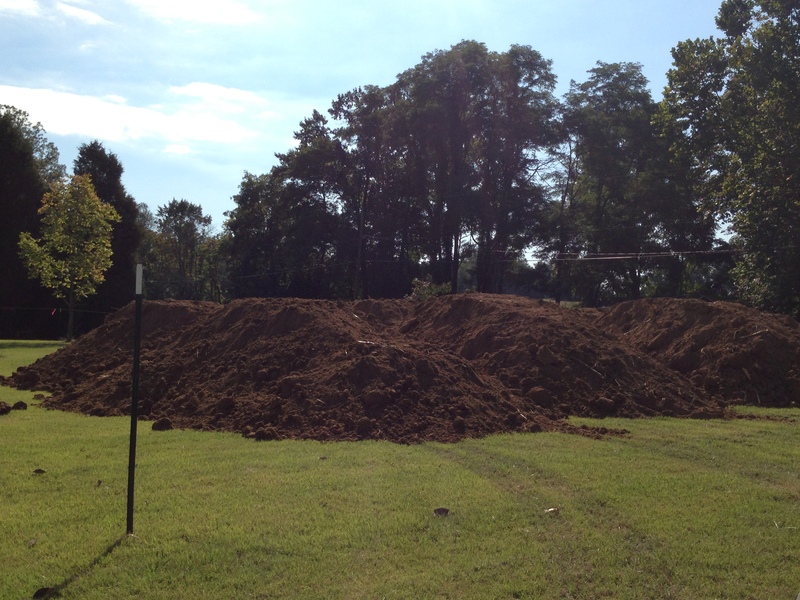 And now Jim and Jill have a pile of top soil to fill in their bare spots! On a personal note, I was able to sign up for my Medicare supplement insurance and a drug plan. All I do is write checks lately! I start on Medicare August 1! 😯 I think I finally found a dentist office down here which will accept the Delta Dental Direct Discount Card. I’m calling them tomorrow to set up cleaning appointments for Bill and I. Bill still needs to find a couple of doctors down here. I found one and have my first appointment on August 6 to have my “Welcome to Medicare” physical. Oh, and I took a tour of the YMCA down here this week. I need to do something for exercise and something to relieve these sore knees. They have several water aerobic classes at the Y Jim goes to. Turns out Jim can add me to his membership for $15/month as long as I live in the same household! He’s going to get me added this week. As soon as I’m a member I can call and try to get into a class. The grandkids can attend the activity center free when I go to classes, too. This is also a way for me to meet new people down here. I’m excited. That’s it for now. Up next: I hope word from the builder! I thought we were done making changes! As I stated in the last post, we had a stack of bids that had come in. Bill went through the bids first line for line. He then started a spreadsheet to enter $ amounts into the correct category, i.e., excavation, building material, block, concrete, plumbing, electrical, siding, stone, windows, doors, roof, gutters, etc. He would enter the subcontractor’s name and the amount of the quote for that particular category. He also had a column for tax and a column for comments. After Bill would get done with bids, I went through each one by category and made notes and questions. It was great having two people checking each bid as we each would catch something that either wasn’t correct or wasn’t bid. After I was done with my examination of the bids, Bill and I sat together and went over them and made changes to the spreadsheet. Bill made notes on any subcontractor he needed to contact either by phone or email for further explanation of their bid or for revisions of the bid. This process took a long time. And, Bill is still following-up on some of them. I guess we hadn’t put enough detail into our spec document to get this area spec’d out. Well, hecky dern! Jill asked what the material was on the mantle. I said I had no idea. I thought someone would bid on how to build it for us. Oops! Guess not. 😕 I’m still learning the ins and outs of this building thing. This fireplace design became a blessing in disguise. I loved this fireplace from the moment I saw it on houzz.com. I wanted the design to look like the columns in front of our house. Plus, I wanted the fireplace to be a focal point when you walked into the front door. The next day, Thursday, June 27, Bill and I went on a mission to find a masonry company who might be able to help us out. We got a quote and it was almost $2K less than the other one! The design was fine and we decided this was another area where we could save some money with hope that Rick’s quote would be less than our other stone bid. 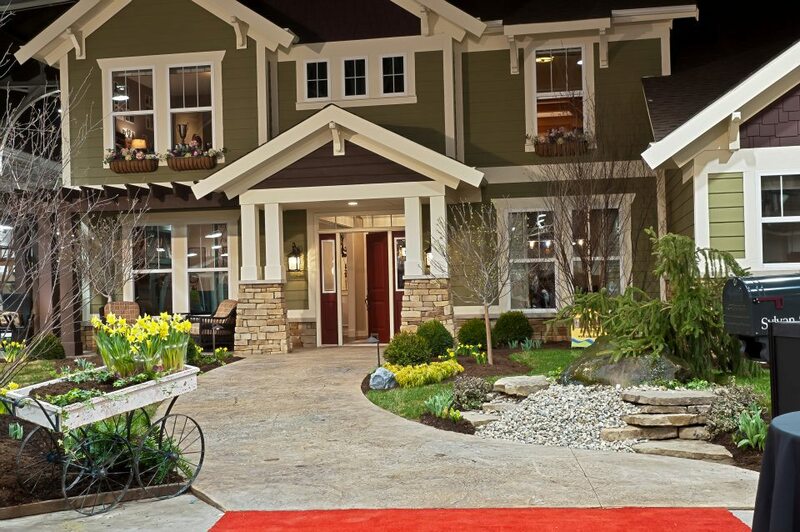 The good thing was that Tri-State specialized in the actual manufactured stone that we had picked out – Centurion. So, when we got his bid, it would be for the same stone as the other bid. Friday Bill received answers and updated bids to several inquiries we had sent out to subcontractors. One big problem we were having was that one lumber company had bid the quote using trusses and the other two lumber companies had quoted stick built. Bill had asked those two to submit a new bid with truss structure. 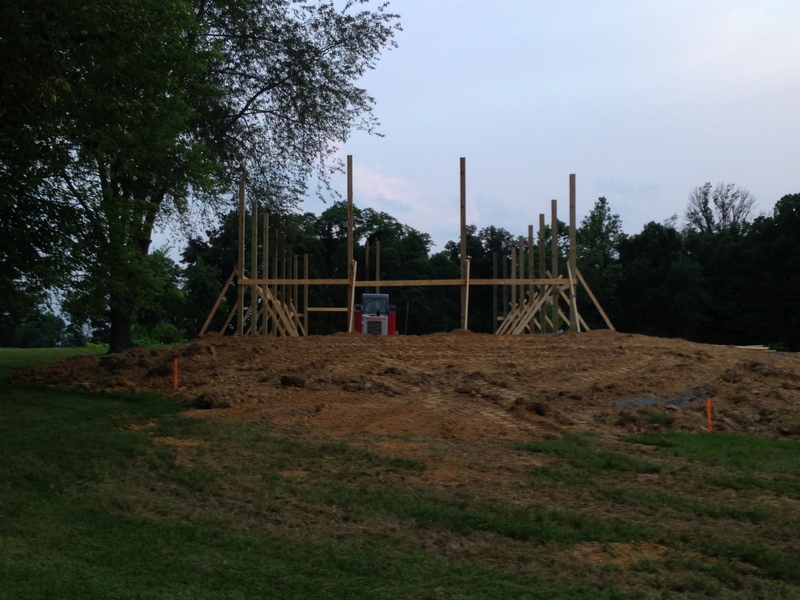 Our framer likes to build with trusses, so that is the way we will go. Unfortunately, this brought our build price up even higher! 😯 Bill continued to update the spreadsheet. In addition, Bill and I went out again Friday morning with Megan in tow to a couple of places trying to decide what to do about our siding. We had originally wanted the Apex Fiberglass siding. However, the only distributor in the area said he wasn’t able to give us a quote for it any longer and he didn’t have an install crew any longer for the siding. That was so frustrating. I even called the manufacturer to find out what was going on and if there was any place else where we could get a quote and get someone to install it. 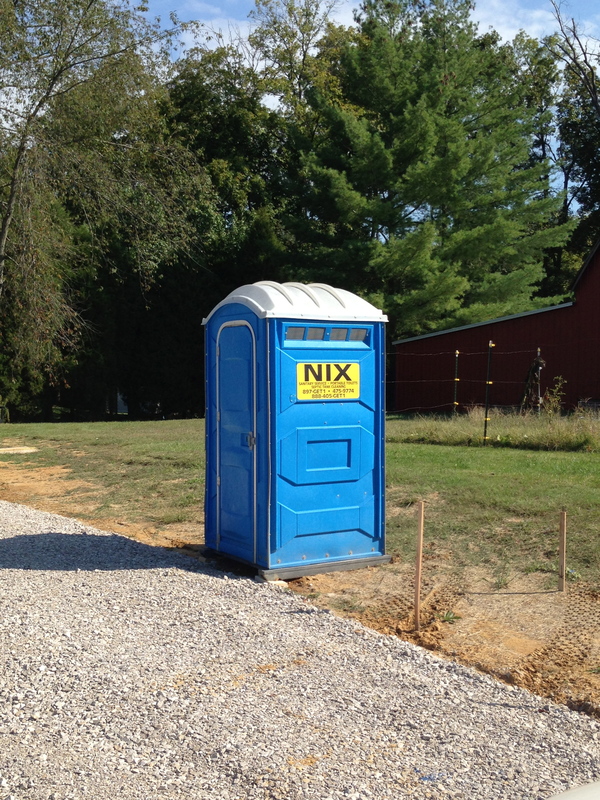 Bill ended up calling a place in Bloomington but they said they only went as far south as Vincennes to install. This was becoming a pain. We finally took this as a sign that we needed to choose another type of siding. 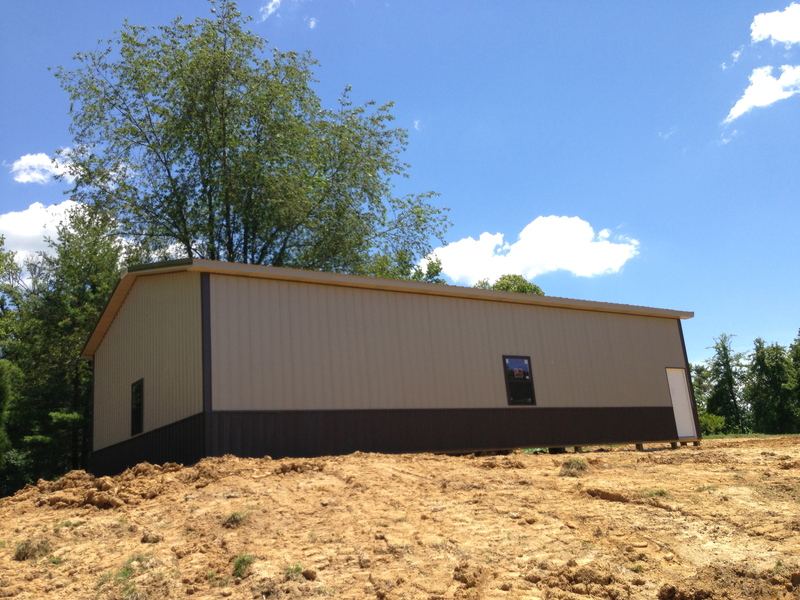 I had chosen the pole barn colors to match the colors with the Apex siding. Now what? 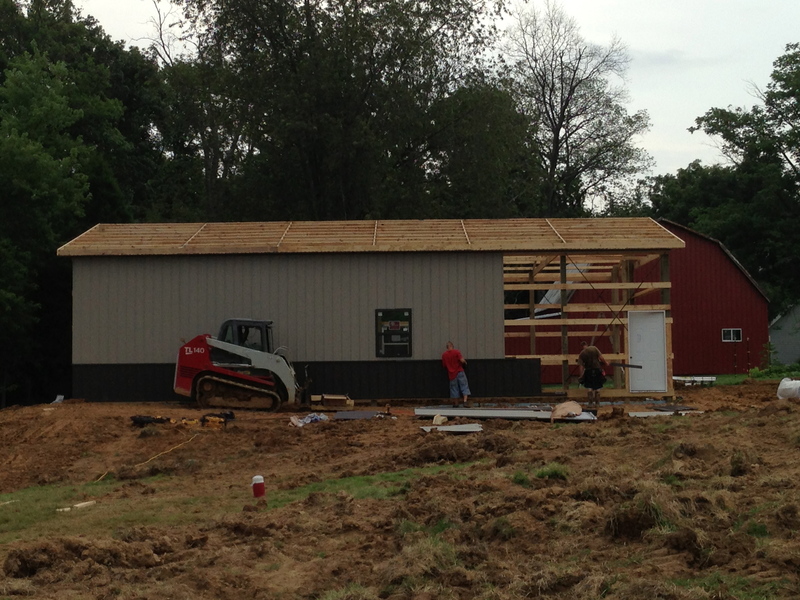 So began the siding, shakes, trim, windows, door and roof saga. On a earlier trip to a lumber company, the guy who waited on us told us about this siding and trim which was in their showroom. He said it was LP SmartSide siding with Azek trim. Remember this as it will come into play later . . . This structure reminded me of the house I fell in love with at the Indianapolis Home Show two years ago. I really liked the green with the white trim. 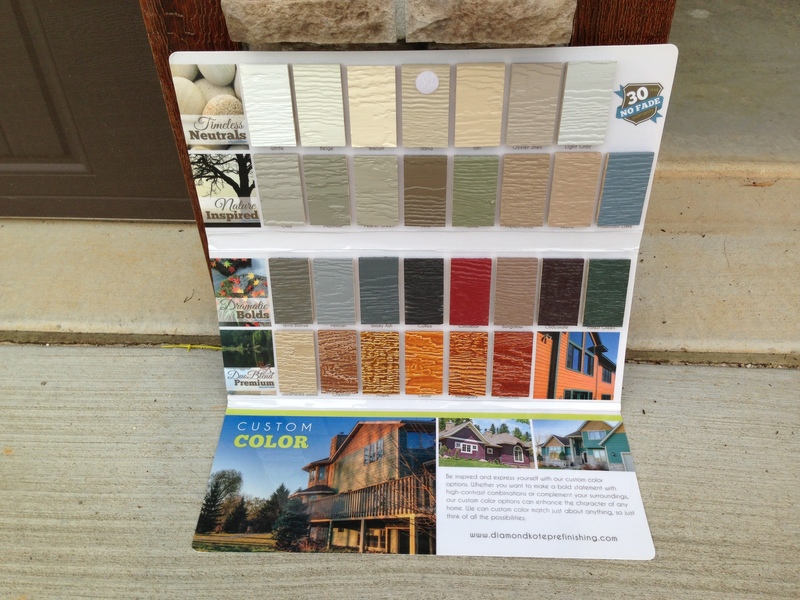 The lumber company sales person gave us several samples of colors for the LP siding. Or at least he said they were LP siding samples. 🙄 The problem was they just didn’t seem to have that green sample of the LP siding which I really liked. We had all these other samples, but not the green. They gave us a sample of a clay color, too. 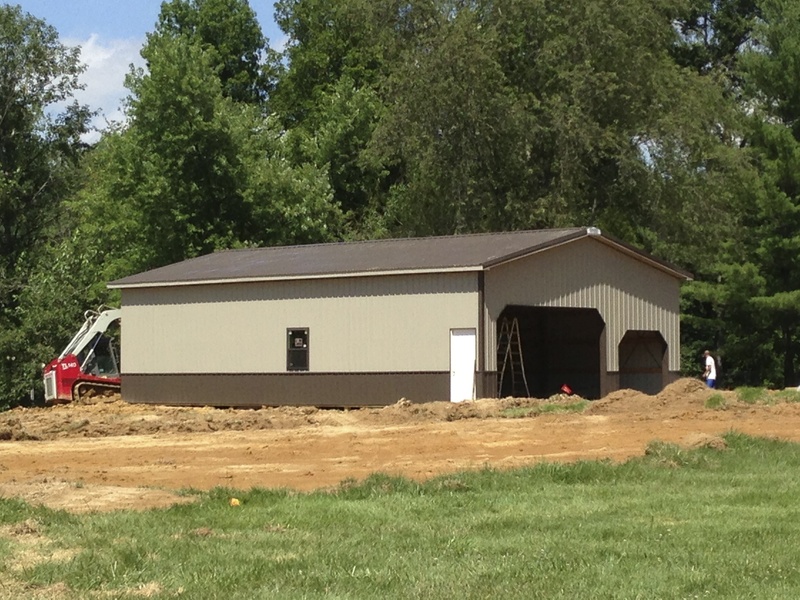 I asked if they had a dark bronze-like trim or shakes that we could use if we went with the colors that would match the pole barn. Unfortunately, their display on the wall was missing several samples – green and coffee. The other dark trim color was way too brown and didn’t blend in well with the bronze windows. The only other thing I had to go with at the time was a printed off piece of plain paper with the color choices. On this earlier trip we didn’t ask if they could order samples for us. But when we got home and showed Jill the color choices on the plain piece of paper, she said she wondered if the Coffee color would match Bronze. Back to Friday’s, June 28th, visit to the lumber place . 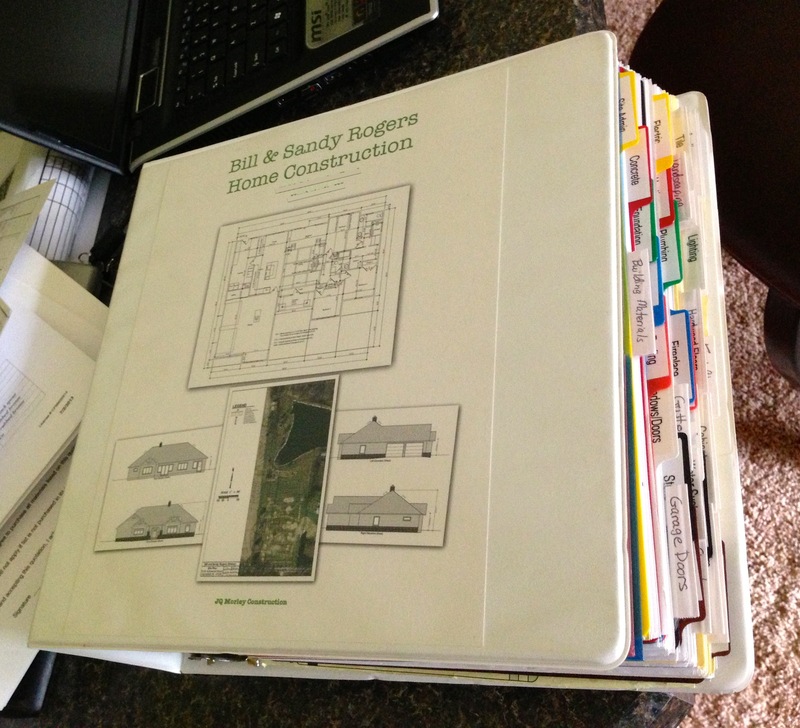 . . We finally got to talk with the guy who was doing our exterior material bids – James. Thank goodness for James. He knew us through our plans and spec document. 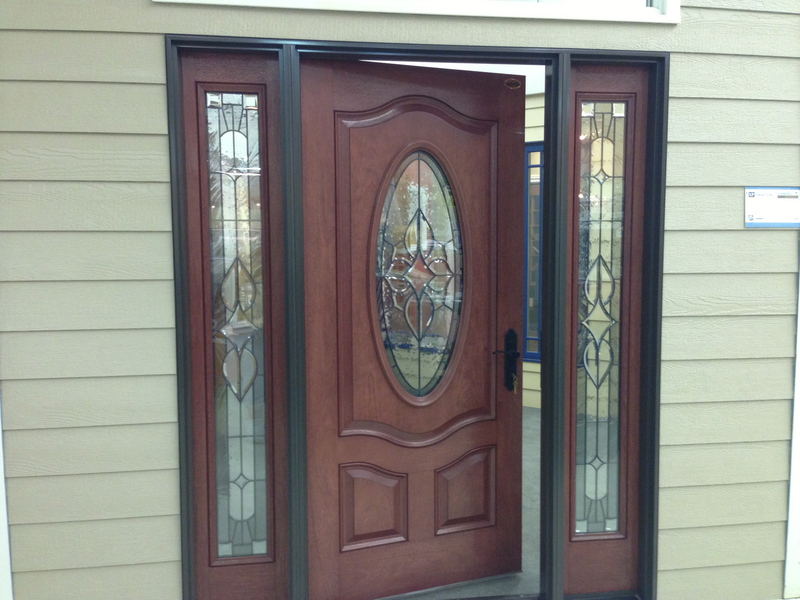 The other guy we saw that day was Joe – who was bidding the Marvin Integrity windows and the exterior doors we wanted. We already had a great working relationship with Joe. Now we had two guys at the same place who were not only willing to work with us with great service but were also willing to be competitive dollar-wise to get our business. We talked to James about our frustrations with changing to a different siding and the lack of being able to match colors. He said he would order samples of any colors we wanted in the LP SmartSide siding. We gave him a list. He said he thought he’d get them in early the following week. In the meantime, he gave us a sample of the CertainTeed Cedar Impressions Double 7″ Staggered vinyl shakes. These were really heavy-duty. 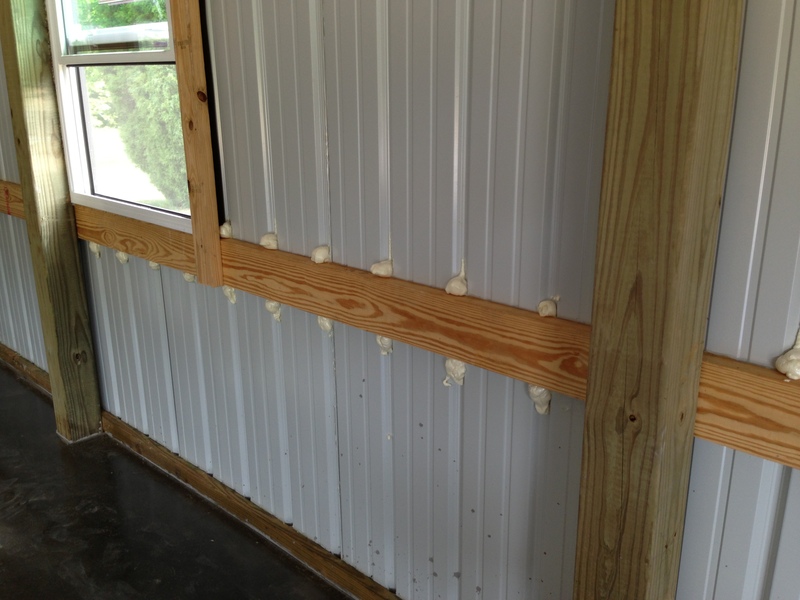 Bill and I didn’t want vinyl siding but we would consider vinyl shakes – especially these heavy-duty ones. We went home that day to see if these combinations would work. 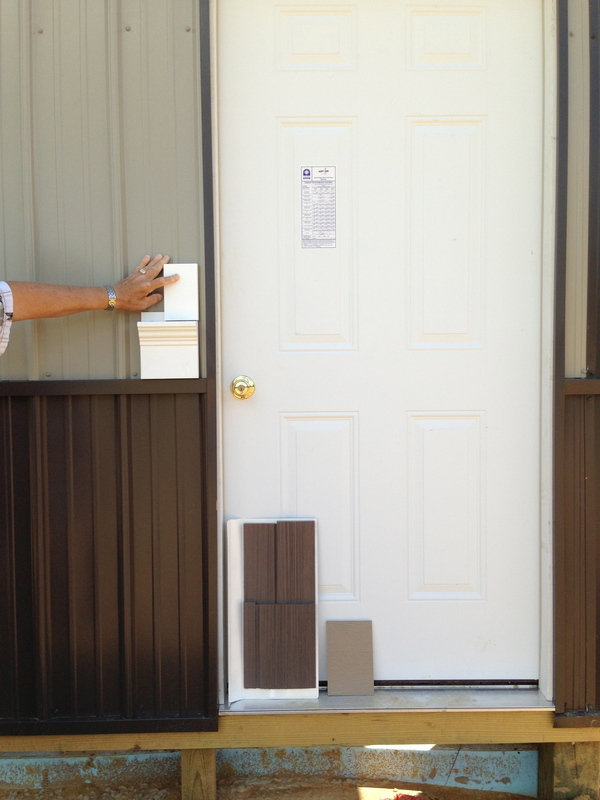 Clay for lap siding, Sable Brown vinyl shakes, White Azek trim and white for exterior windows and doors. Guess what? I didn’t like the White against the Clay color. I didn’t mind the White against the Sable Brown or the White against the Bronze, but I thought the White against the Clay was too stark for me. And most of the trim was going to be against the Clay lap siding. Bill knows from experience, I have final say on colors. By this time he was like this. Make a decision, already! Fast forward to Monday, July 1. We made arrangements to make another round of vendor shopping. We took Jack and Megan out for breakfast and then dropped them off at Jill’s workplace so as not to subject them to a dull afternoon of house-building shopping. Our first stop was Menards. 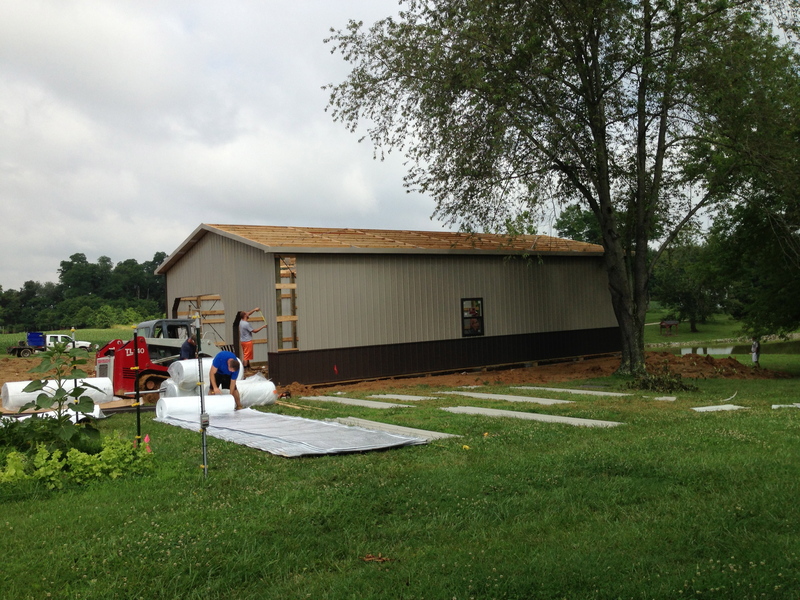 They carried the LP SmartSide siding. We wanted to see if they had any color samples we could see. Turns out Menards used a different prefinished color manufacturer than the lumber company. They had different colors and their only samples was a shiny brochure. 😡 However, they had lots and lots of samples of the CertainTeed Cedar Impression Shakes. I grabbed every color sample we thought might work. We had gotten a call earlier in the morning from Kight Lumber (the lumber company we’d been visiting often). James said that Marvin had the windows and sliding door on sale and we could get another 10% off. Yay!!! And, he said he thought the siding samples would be in that afternoon. So, our next stop was at Kight. James and Joe smile every time we walk in this place. Now, they might be smiling and thinking, “Oh no, not these people AGAIN!” But, no matter what, they smile at us and never appeared or act frustrated. James said the samples had just gotten there and he started to open a package. Needless to say, we were all surprised to see all the color choices! And, this was the Diamond Kote Prefinish. I had read about them. They were highly recommended. And, their finishes had a 30 year no fade warranty. The prefinisher at Menards only had a 15 year warranty. See all our choices? Can you imagine what Bill thought when he saw me get so excited with all of these? I did put the Olive sample up to the Green Hardy Board and it was a shade lighter. 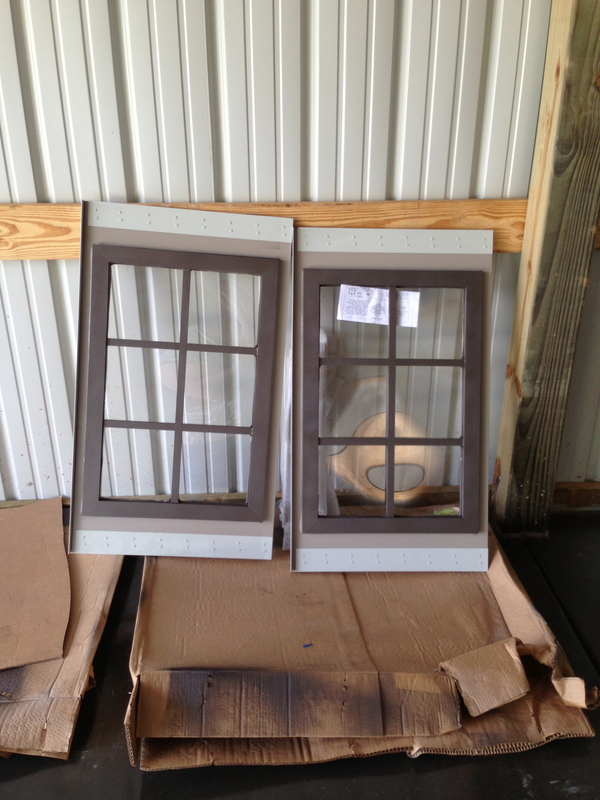 Since the lighter color didn’t bother Bill or I, we said the Olive LP Siding could still be an option. We looked at roof shingles and picked out two. We liked the Bronze trim around the mahogany stained door below, so we asked that Joe quote us what that would cost if we went that route. This was not the door we wanted, but it was the stain color. We had a cart full of samples and headed out. Our next stop was at Tri-State Stone. Bill wanted to check to see if Rick had gotten all the bid information. I asked Bill to see if there was any way we could get a sample of the Centurion Cutface Suede stone that we had picked out. It was a quick in-and-out. Bill said Rick made the comment that there was a lot of stuff included in our bid specs and he was still weeding through it. And, we got the stone sample. The Olive siding choice was pretty simple. 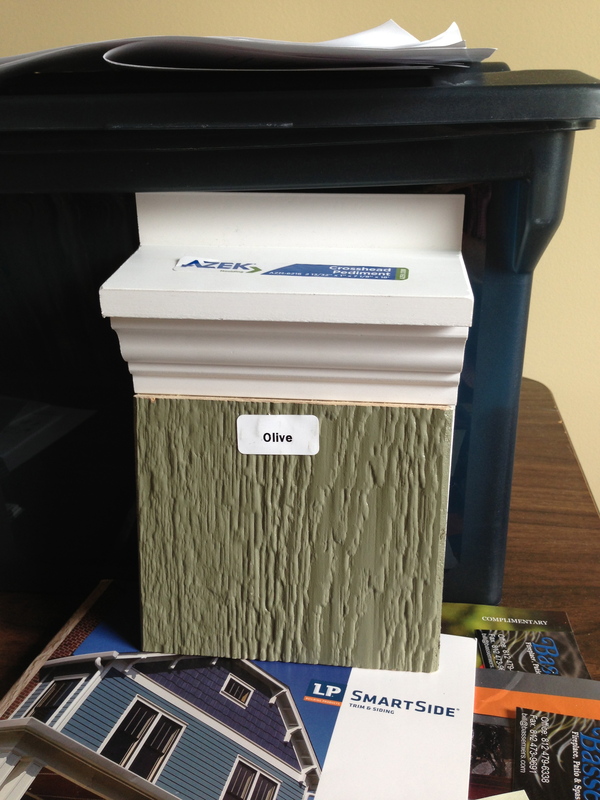 Olive siding with Azek White trim and White window and door exteriors. The goal for the other color choices was to see if Clay or Oyster Shell would be the best match with the shakes, stone, and trim. With Jill’s help, we decided that if we went with the taupe tones, we would go with the Oyster Shell color for the lap siding. It blended in better with the stone and matched well with trim and shakes and either of the roof shingle choices. When we were going through bids last week, Jill had shown us a picture of what she had done when she was trying to make exterior color choices. She had Jim print her out several small copies of the exterior of their home and she would color them with colored pencils. Her colored drawing looks almost identical to her home. She said it was a great way to see how it would all look. Looking at the pictures Bill and I couldn’t make up our mind whether we wanted the Olive or Taupe. There were advantages to both. I really liked the Olive but was afraid that it would look like we hadn’t thought to coordinate the colors with the pole barn. We couldn’t change the pole barn colors. That sucker was built and was staying that way! 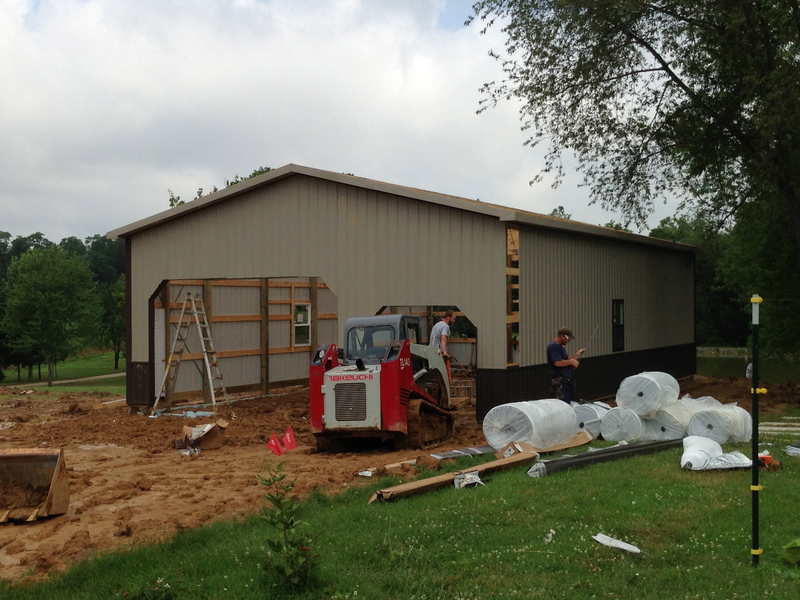 Picture the siding color on the house to look more like the lap siding on the pole barn. We didn’t have the right colored pencils. I did what I could. What do you think? 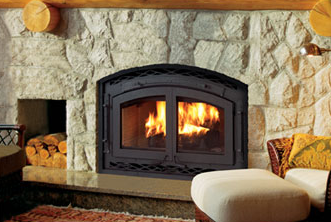 By the way, we did get the bid from Tri-State Stone for the house, fireplace, and chimney. It came in about $3500 less than our other quote. I think you know who is going to get that job! 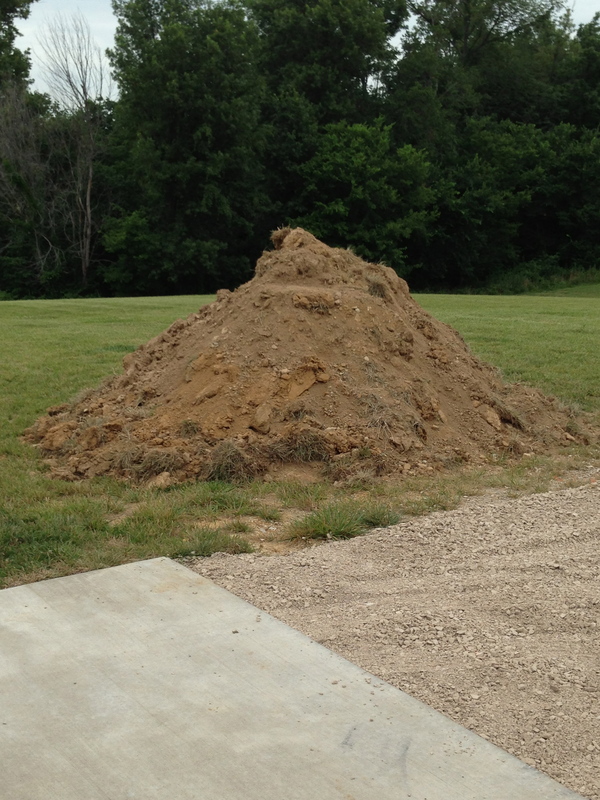 Sometime yesterday someone with the pole barn construction delivered a big pile of rock in our driveway. If it doesn’t rain, maybe we will see some workers down there tomorrow shoveling that rock into the pole barn. The rain has held them off several days. Tuesday I saw the garage door people come and go. Bill got a call yesterday. They said it was way too muddy for them to install the garage doors. As soon as Jim gets back from Africa, we need to sign a contract with the construction company and send a copy to our bank along with set of plans and line items from the bids. Then, we hope to start building. Were we able to make enough cuts to build this house at the price we wanted? Not really! Yes, we were able to save here and there. I hope the stock market goes up and up – cause we’ve decided to take more out of our savings to build this house the way we want it. You only live once! Next up: Will it ever stop raining? Will we ever get our stuff out of storage and move it down here? 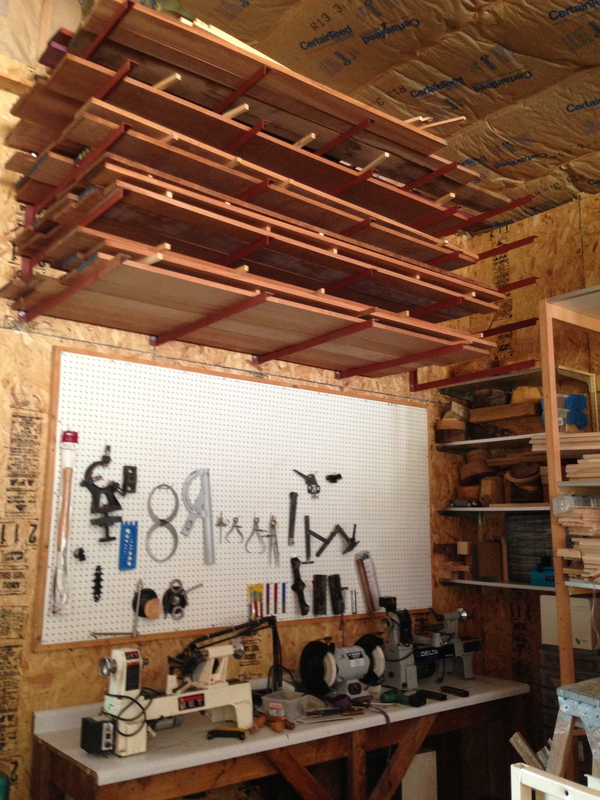 Will Bill get back to finishing our cabinets? No, this is not the beginning of a new chapter in my life; this is the beginning of a new book! That first book is already closed, ended, and tossed into the seas; this new book is newly opened, has just begun! Look, it is the first page! And it is a beautiful one! I love the quote above. It kind of explains what Bill and I have felt since we packed up all our belongings, officially became homeless, and moved to an area which will become our newly adopted retirement community. Half of the back seat of my car was full of our clothes, my computer, our coffee maker, and a bin of stuff. The front seat was full of cloth bags of food and dry goods. 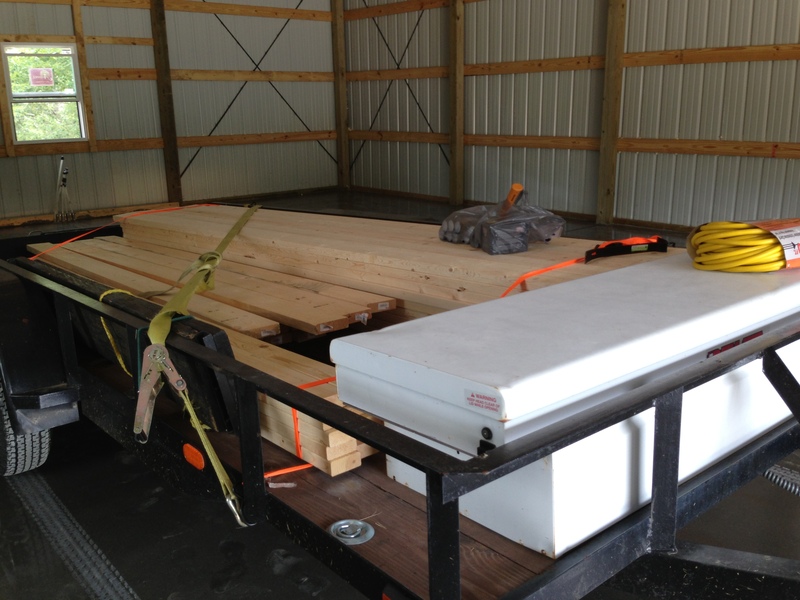 Bill’s truck bed and back seat were full of his tools that he didn’t send to storage. He also stuffed in anything left in the house that I couldn’t get in the car. 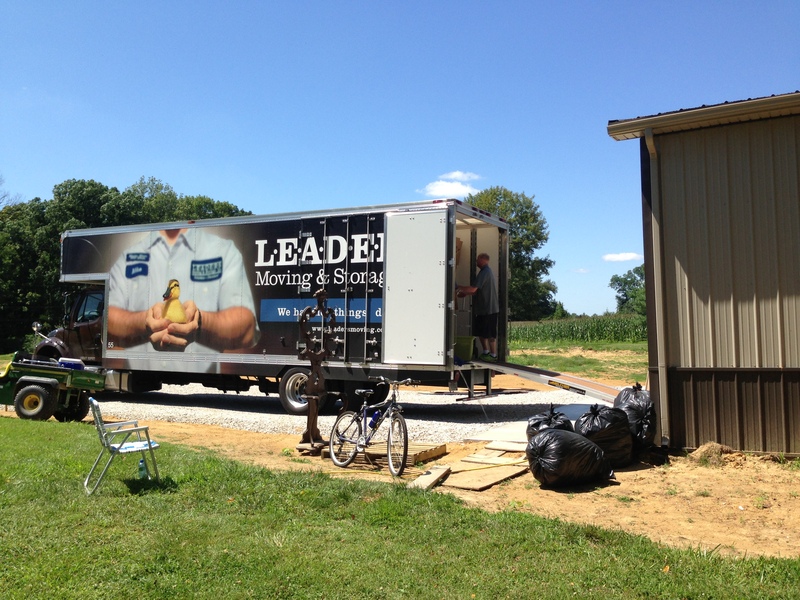 The trailer had three coolers of frozen food and everything left in the fridge; the Dyson vacuum cleaner, brooms, and several bins full of stuff, in addition to the office furniture. We got up early and started packing all the above into the vehicles. While Bill worked on covering the truck bed and trailer with a tarps, I did a final clean of the house. I was on the road to Jill’s before 7:00 am! Bill was staying behind to meet with the new owners at 10:00 am to hand over the keys. I have to tell you . . . I NEVER want to do a move like this again. It was both physically and mentally exhausting. I arrived at our property really early. So early I didn’t know if Jill and Jim were even up yet. 😯 They had gone out the night before to celebrate their anniversary and the grandkids had spent the night with Jim’s parents. 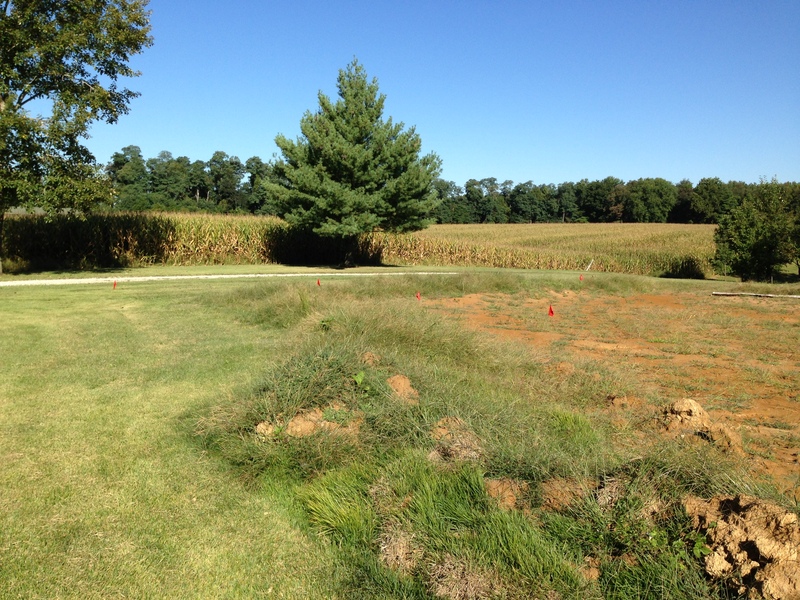 When I pulled into J&J’s driveway, I was greeted by these sites on our property. 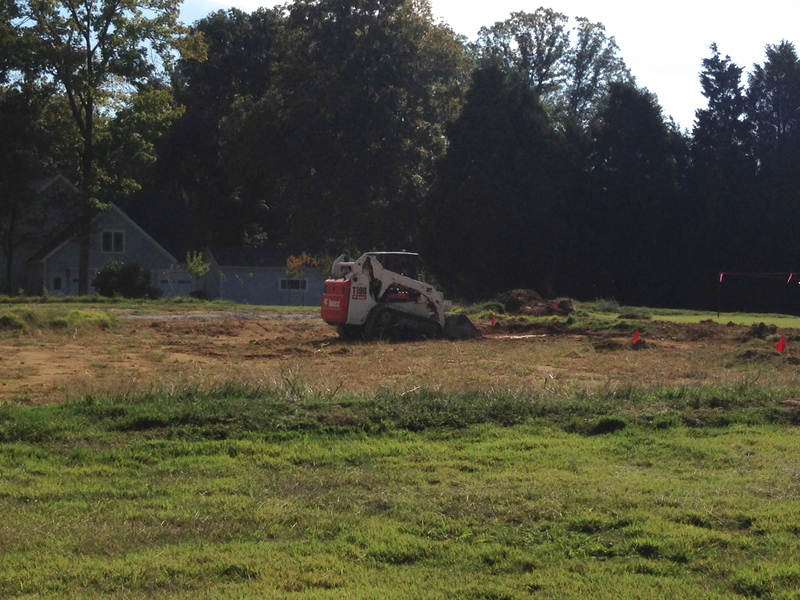 The Excavation had begun for the new house, driveway, and the pole barn! I was having some mixed emotions. Part of me felt like I was here for a visit. My brain had not wrapped around the thought that we were actually going to be living here. All I knew was that I was tired. And, I wanted to sit or lay down on something soft. Spending the last three days sitting on lawn chairs and sleeping on blow-up mattresses had taken its tow on me. After Jill and Jim left for church, I made several trips back and forth to empty the inside of my car and drag our stuff up the stairs to the bonus area apartment where we would be living. I finally collapsed on the couch up in the bonus area and fell asleep for 1/2 hour. It felt great! Jim’s mom called to invite us for a late lunch. I told her I wasn’t sure when Bill would be arriving as I had come down earlier. Turns out Bill arrived around 1:30-2:00 and we enjoyed having a great home-cooked meal even if we felt like we were prying our eyes open from lack of sleep and pure exhaustion. Jim and Jill helped us unload our vehicles and trailer. Bill and I slept very well that night! 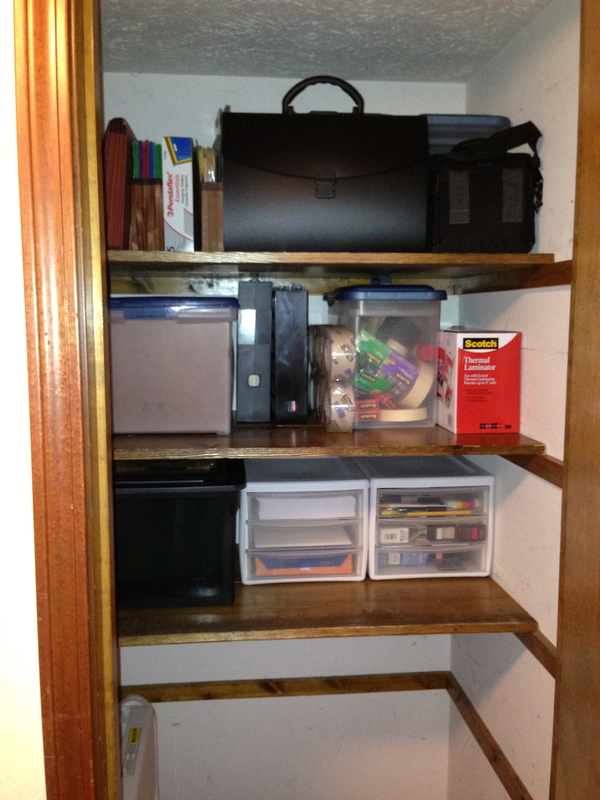 Anyway, within two or three days, I unpacked and found a place for everything. This is our two bedroom apartment. We love it. Who wouldn’t? Thank you Jill and Jim for letting us use your bonus area as our temporary home. Here is where we are living! On top of getting settled in, Jim sent out the bids for our new house the Tuesday we arrived with a deadline of submitting bids for Thursday, June 20th. Jim was leaving for Africa on Sunday morning, June 23. (1/2 trip was a mission trip; 1/2 trip he is doing a Mount Kilimanjaro climb) It was a busy time for all of us! The excavator spent a couple of hours each day moving dirt around on June 11-13. Jim text us that he had a meeting scheduled with the excavator at our property the evening of June 13 and we needed to be there. 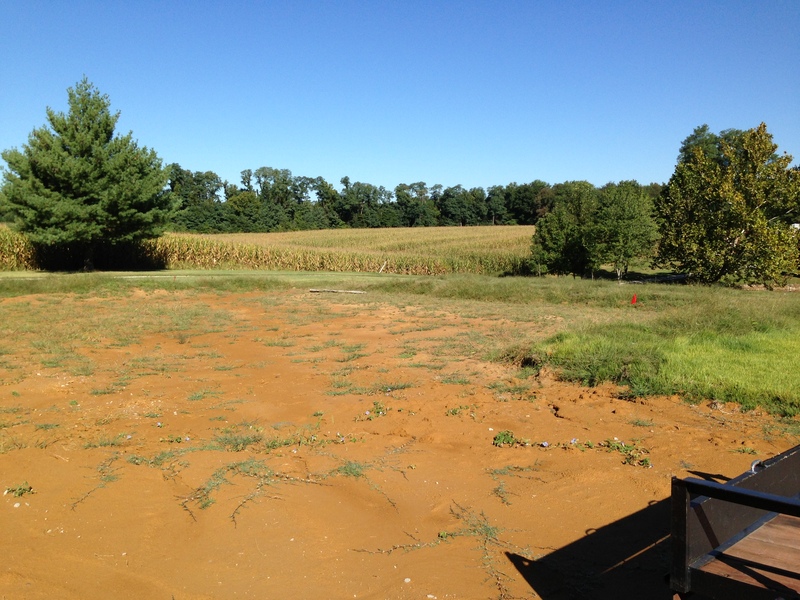 We were suppose to go over decisions of elevations of the pole barn pad and the driveway and house/garage. Hmmmm, okay. I didn’t know what I could contribute, but I said I’d be there with Bill. All I can say is we have some rich dirt on our property. It smelt like manure when we went down there that evening. I think my only contribution that evening was to ask Jim’s dad for his advice on the excavation. I liked his advice and said to go with whatever he said. 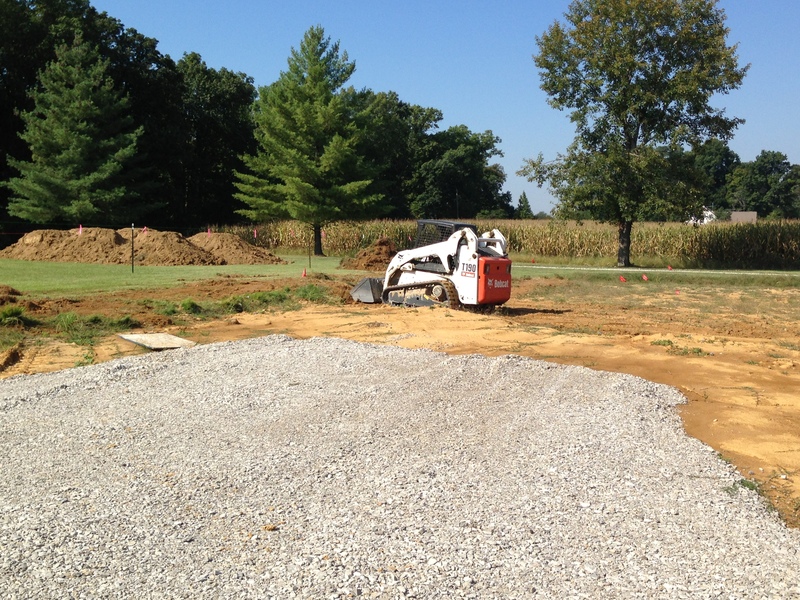 Here are some pics of the excavation job and a video of the very large commercial equipment our excavator used. 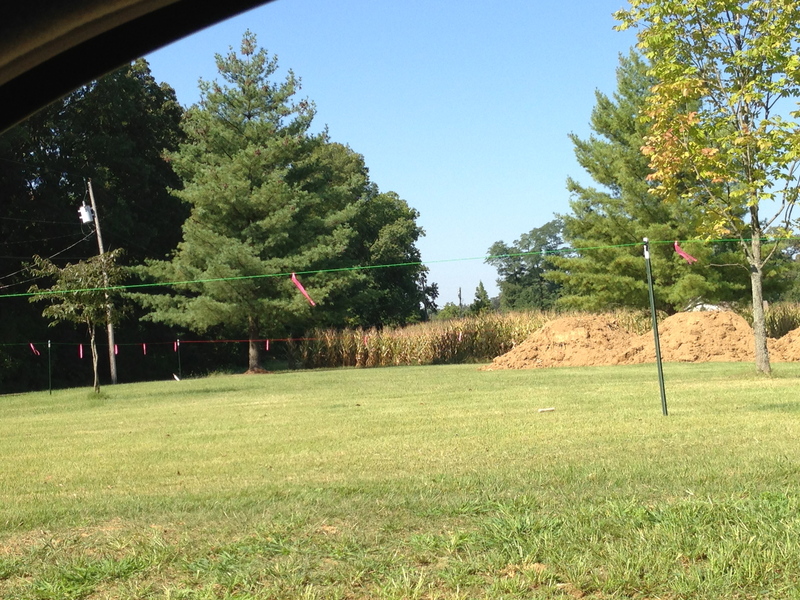 They had to really build up the pole barn pad. But we were very fortunate we didn’t have to haul in dirt. We had enough by digging out the driveway and part of the crawl space for the house. I loved watching that big ‘ol machine, but I was afraid it was going to tip over! By the time we finished our first week here, Goldie and I both started having some problems. Since we had just been down here for a short time, I hadn’t found a doctor yet. (I have one now!) So, with the advice from my Indy doctor’s office, on Tuesday, June 18, I took myself to a local urgent care and ended up with a diagnosis of a bladder infection (my first). They sent me away with a prescription for an antibiotic. 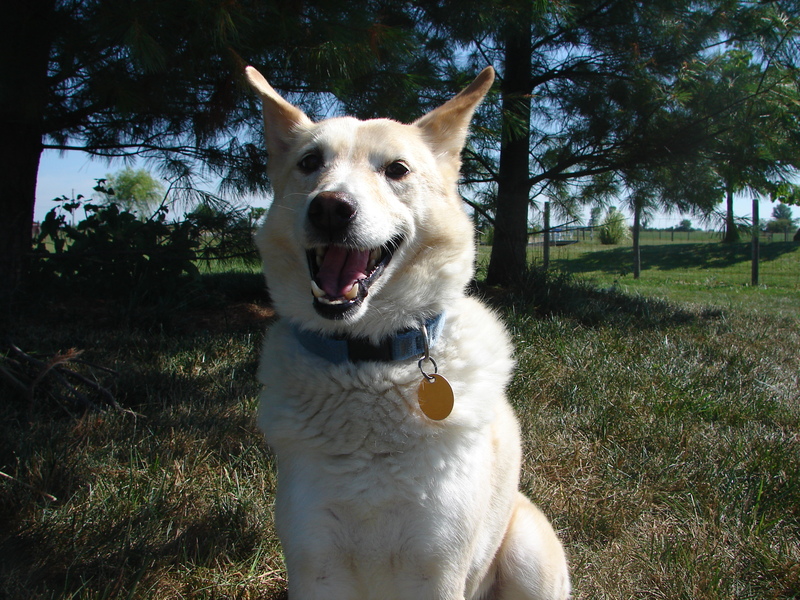 I took Goldie to the vet that same afternoon. They were unsure what her diagnosis was (she was having bladder accidents!) but gave her a shot and put her on an antibiotic, too! Both of us have been fine ever since we got on medication. Yay! Funny thing is, both the doctor and vet said it could have been the stress of moving. 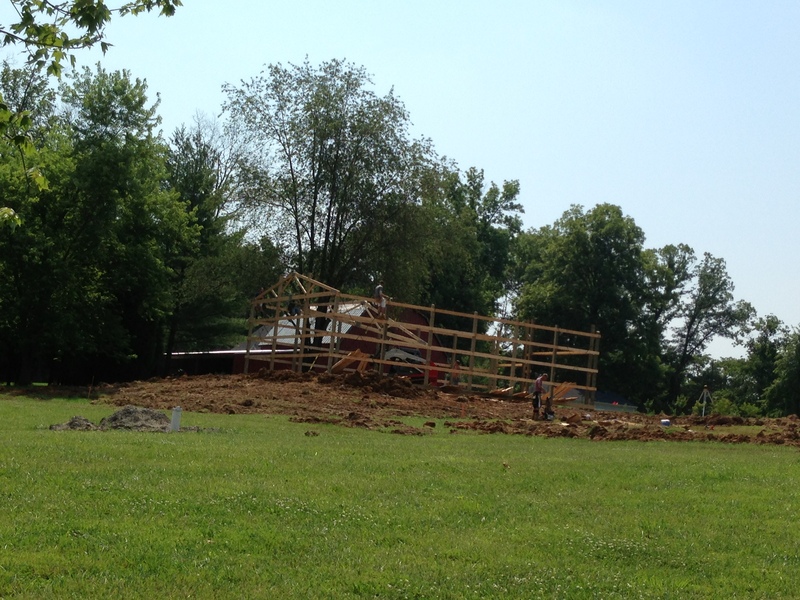 They delivered the pole barn materials on Thursday, June 20 and started building it the next day. Here is what they did on Friday the 21st. Still waiting for the cupola to go on the top! That was one thing that I picked out for the barn. And, they called and convinced me to get an upgraded one, too! I can’t wait to see it. 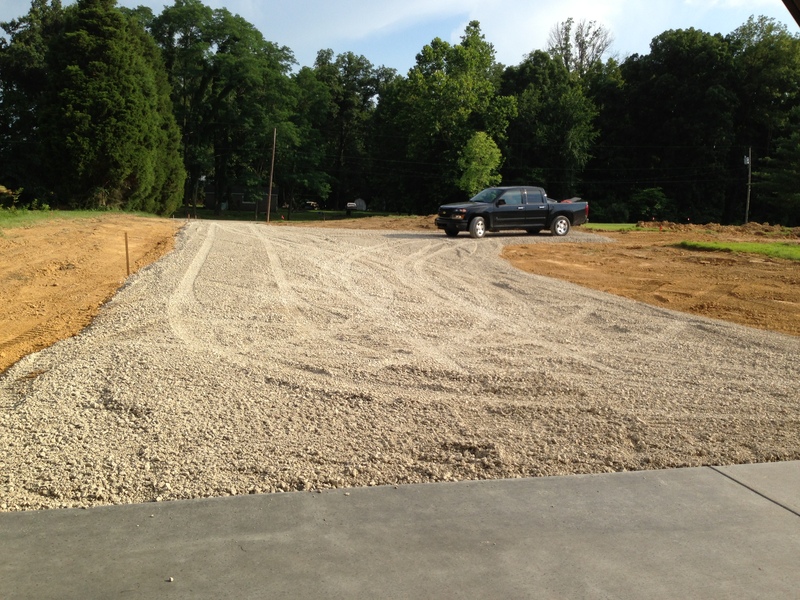 The excavator delivered some rock this morning for our driveway. 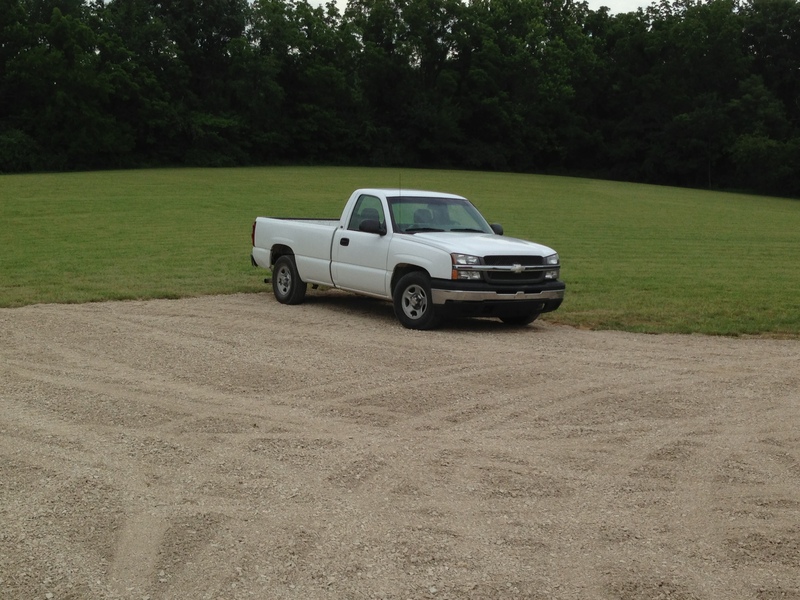 Now the pole barn guys can bring their truck in next week with a load of rock and spread inside the barn. After that they will put an insulation blanket down and then lay the pex tubing for the radiant heat floors. 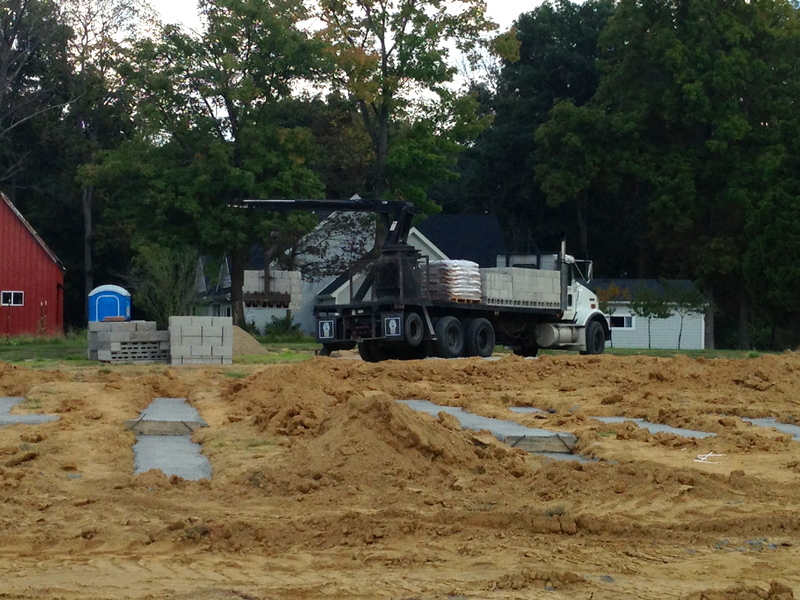 Then they can bring in the concrete truck and pour the pole barn floor. I wish I could say that the house bid $$ were going as smooth as the pole barn did. They are not. 😥 The house is coming in way higher than it did last fall and we’ve already put (or will be putting out of our own money) close to $175K! We paid for the lot, all the light fixtures (inside and out), door hardware, laundry and kitchen cabinetry, the well, excavation costs, plumbing for pole barn (bath rough-in and radiant heat), and the pole barn. We went through the bids the other night with Jill after Bill and I had worked on them for a week line for line – Bill more than me this time. Turns out lumber has gone up almost double since J&J built. Jim’s brother did some checking and he said that even though the construction business is picking up, the lumber mills are still closed from the housing crash. Demand is more than supply. We are trying to find some ways to cut the cost of the home we want to build without compromising the look and feel of it. 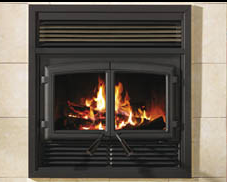 We have found a couple of things – (siding and fireplace changes) to save some costs. Unfortunately, it’s not enough to make up the high lumber prices. Next up: Will the expensive cupola be worth the wait and will we actually start building the house we want in July? I left you several days ago not knowing what would happen next. Wondering about those white SUV people. Wondering if we would show this house to anyone else. Wondering if we would sell this house. 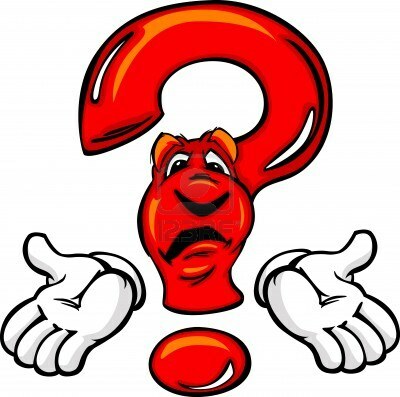 Well, we got the answers to all of those “wonderings” Wednesday and Thursday. Let me set the stage . . . After I added my last post early Wednesday morning one of my online friends posted on Facebook that I should pray for peace instead of patience. I thought about this and it made perfect sense. If I prayed for patience, that meant I was asking God for me to wait and wait. If I prayed for peace within, I was asking God for calm and tranquility. So, I immediately started praying for peace (Thanks, Laura!) while I started to clean the house for the second showing that was scheduled for 4:45 that evening. Turns out it was an offer from the people with three children who had looked at our home on Sunday, May 19. It was a low offer. In addition, they were wanting closing cost money, too. But, it was an offer and the people really loved the place and wanted to raise their children in the home. They always say to work with the first good offer. Bill and I discussed how low we would go to sell the place. We were far apart in what we wanted and what they offered. After Bill and I talked, we called our realtor Mike. We were discussing our next steps when I heard a beep on the phone. I looked at the display and it was Centralized Showing Service. Really? I told Mike and he said to take the call and call him back. It was a request to show our home that evening at 5:00-6:00 pm. We had the second showing people coming at 4:45-5:45. It was an automated phone call. Our options were to Accept, Decline, or Reschedule. I hit the Reschedule button. We were then routed to a live person. 🙂 The first thing I said was that we already had someone looking at the house during the time the realtor wanted to show it. The CSS guy said that the realtor was aware of that and still wanted to show our house at 5:00-6:00. I asked if realtors ever did that and he said yes. I asked if we could call them back after talking to our realtor. We weren’t sure what to do. We had the offer to deal with. We had a second showing coming. Do we invite another person in on the mix? We called Mike back. He said, “I love buyers. The more the merrier. Let them come.” We thought why not. We will have the house clean. Get two for the price of one around the same time. That was settled. Then we started to talk about the offer. This was Wednesday morning. We had until Thursday evening at 7:00 to respond back to the offer. 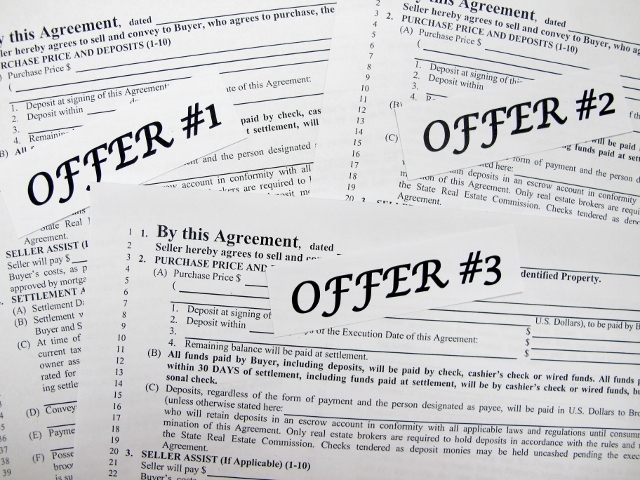 We all agreed on a price with which to counter the offer and decided that we would wait until the next day before making any final decisions. Mike said that he would call both real estate agents that evening after the showings to make them aware that we had received an offer that we could work with and if they were interested in the home they would have to act fast. We had a plan. Bill and I hugged each other and went back to cleaning each of our areas – Bill to the pole barn, me to the mid level of the house. I got done cleaning around 3:00. I decided to run to the grocery and buy some cookie dough to make some cookies for the showings and to take some over to our neighbors as a thank you for letting us sit on their back patio that evening during the showings. Bill moved Goldie over to our neighbor’s yard and I came over after I did a second vacuuming of the house and turned on all the lights. Then we waited. Right before 4:45 we heard some car doors shutting. I think I was the one who went inside Alan’s (neighbor) house and looked out a window to see if the cars were at our house. Guess what? It was the white SUV people! 🙂 I felt those people must really be interested as not only was this their second showing, but we had seen them in front of our house several times since the first showing and once just a couple of days before. We visited with Alan and their dogs safely hidden on the back patio. Goldie wandered in Alan’s yard on the side next to our house back and forth. You cannot see our house or our back yard when you are on the neighbor’s back patio. 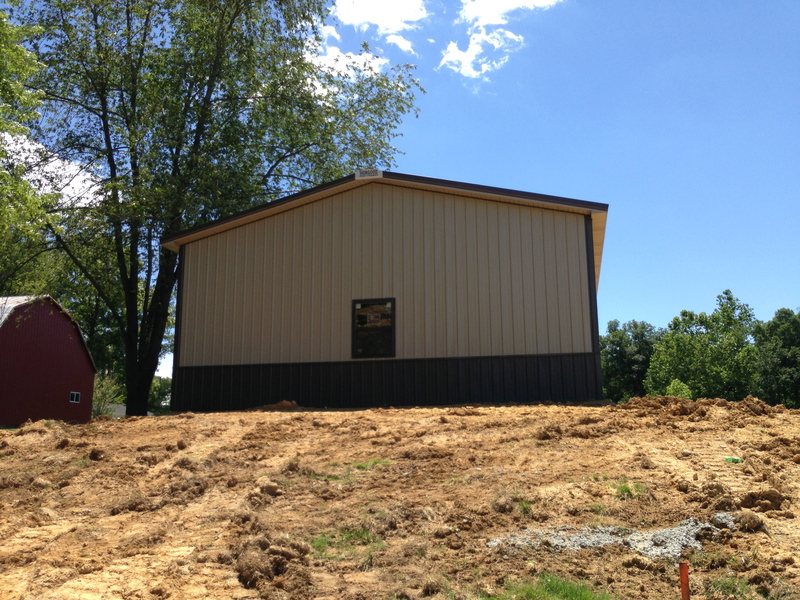 However, you can see the pole barn if you sit in one small area. That’s where Alan sat me with a chair. 😉 The white SUV people stayed in the house for about 30 minutes – until about 5:15. The other realtor still had not arrived. Then we heard a child squealing next door and people talking. We could hear them opening the shed. Then they walked out to the pole barn. The couple looked young. They had a baby and a boy around 4 years old. They had another gentleman with them besides the realtor. We figured it was one of the parents. After looking in the pole barn they returned to the house where they stayed until they left about 5:45. The other realtor still had not arrived! We could not hear anything and Alan stayed out there for a while. When he came back to the patio he said, “They are really interested in your house!” He said they loved the place and loved having horses next door. They eventually left about 6:45. We gathered our belongings and Goldie and walked back home. Bill decided to call Mike and tell him about the last showing people and their interest. Mike said he would call both realtors around 8:30 that evening. Mike called us about 9:00 to tell us what was going on. He said the white SUV people’s realtor had sent him two emails after the showing before Mike had a chance to call him. 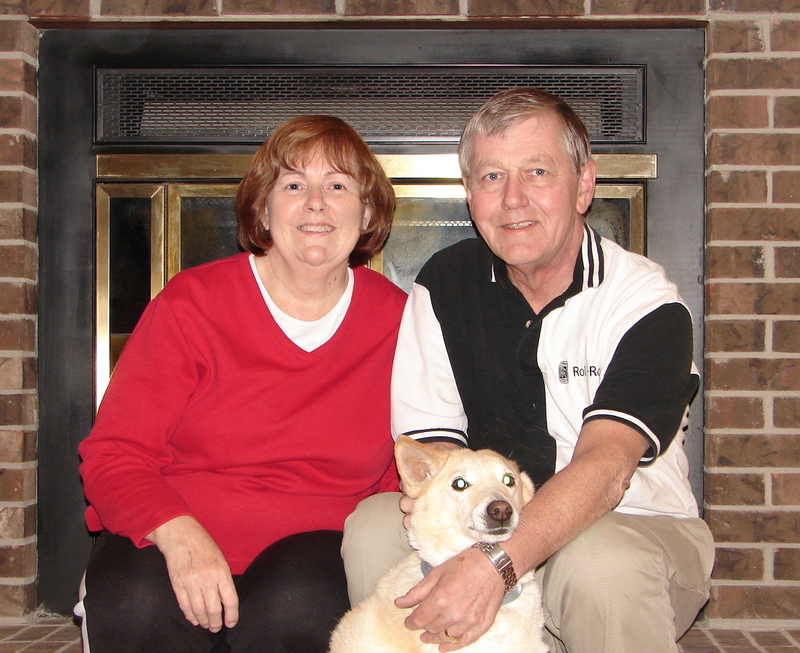 One email asked Mike to ask us why the kitchen faucet didn’t work; what was the gurgling noise when they turned on the small faucet in the kitchen; and where was the septic in the back yard. We told Mike everything was working fine and I had just used the faucet. It’s a lever type of faucet where you push back to get hot water and front to get cold. However, you must push the lever out to get the water to come out. Apparently, they had never pushed out! 🙄 And, the gurgling noise was the reverse-osmosis faucet and that’s just how it operates. Then Bill told Mike that there was a very visible riser in the back yard a few feet from our back patio to designate the septic. Mike said he was frustrated with that realtor. He said the other email said his clients planned to make an offer but they felt our list price was too high. This was the second time he had reported that. Mike said he would email the realtor back with our answers and to tell him about our other offer. In the same phone conversation Mike said he had a voice-mail message from the realtor of last showing people and she wanted to know if we had already received an offer and how quickly could we move on this house as they were interested. OMG, you mean we had three different people interested in buying the place? In my wildest dreams I never imagined that would have happened to us. Mike said he tried to call the last realtor but she didn’t answer. He asked us how quickly we would be willing to move if it came down to that. Bill said if the price was right, we could move in three weeks! 😯 Notice, Bill said that, not me! Mike blind cc’d us on the two separate emails he sent to the two realtors. Basically he said if they made an offer to make it their highest and best because he would not go back for a second round except for the first offer. And, if offers came in, he would tell the first people that we had multiple offers and they could choose to hold or make another offer. Sounds a little like poker, doesn’t it? Hi Mike! As always, very nice talking to you! Attached is a full price offer . . . I got that far and screamed for Bill! Did I read that right? I suggested we go down to the desktop computer in the family room and pull up the email and the offer. It was true! They were offering us our full listing price but asking for $3000 in closing costs and the home warranty we had offered in our listing. The kicker was, they needed to close on the house on June 7 and wanted possession no later than 5:00 pm on June 10. That was less than three weeks away! Well, Bill and I looked at each other and said that this was a no-brainer. Unless Mike thought there was a reason not to, we would accept this offer. We hugged each other and then quickly called Mike. We talked about how to handle the situation. What did we do about the first offer? After much discussion, Mike said that there was probably no way the first couple would come up to full price from what he gathered from the agent. So, we checked the Accept box, signed, dated, scanned and emailed the acceptance page to Mike. We checked the Reject box, signed, dated, scanned and emailed the rejection page to Mike from the first offer. OMG! We sold the house in two weeks after it was listed! Well, at least house listing status has changed from Active to Sale Pending. Now, we just hope that the house appraisal and inspection go well. We don’t expect much wrong from the inspection as so much of major items are new. We already had a well inspection done before we put the house on the market. Bill emailed Mike to ask him if there were any special things he should check before the inspection. One of the items was electrical and the other was having the HVAC serviced and cleaned. So, Bill scheduled having a routine check-up on our 3-year old HVAC system done on Tuesday. Bill is switching out some electrical boxes/switches on any wall that might be close to water to meet a new code requirement, too. The inspection has been set for May 30. 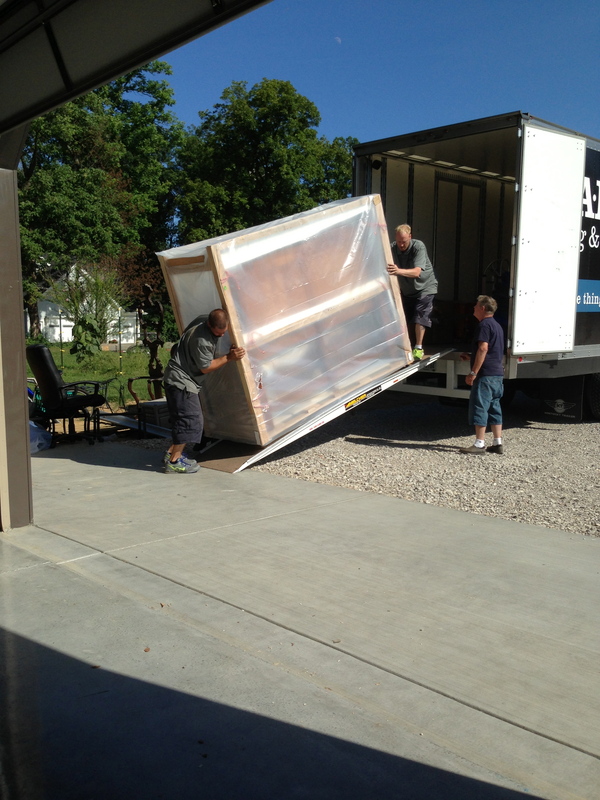 We got word yesterday that they are doing the appraisal tomorrow – on Memorial Day! Oh well, we’ll be here. And if everything goes well, we are set for the June 7 closing! 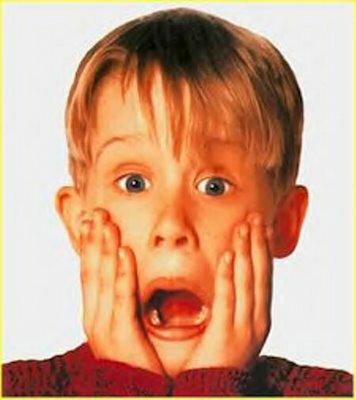 Bill and I went into panic mode on Thursday after we accepted the offer on the house. We called movers. 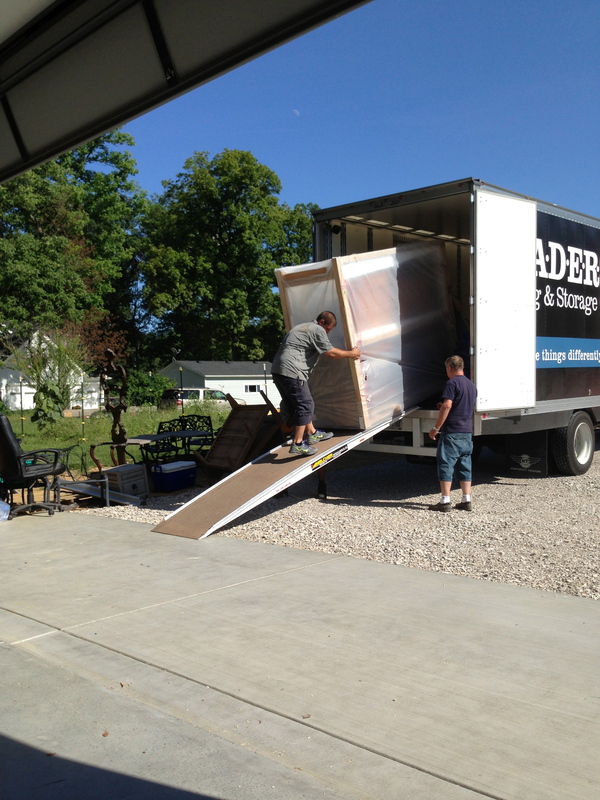 We are tentatively on one mover’s schedule for June 6 and on another mover’s schedule for June 8. Both are coming out next week to give us estimates. We contacted both our children to tell them about the offer. Jim had some suggestions for Bill to see if there was any way we could get that pole barn built before we moved. That has not panned out. It will probably be the end of June or first of July before that will be done. 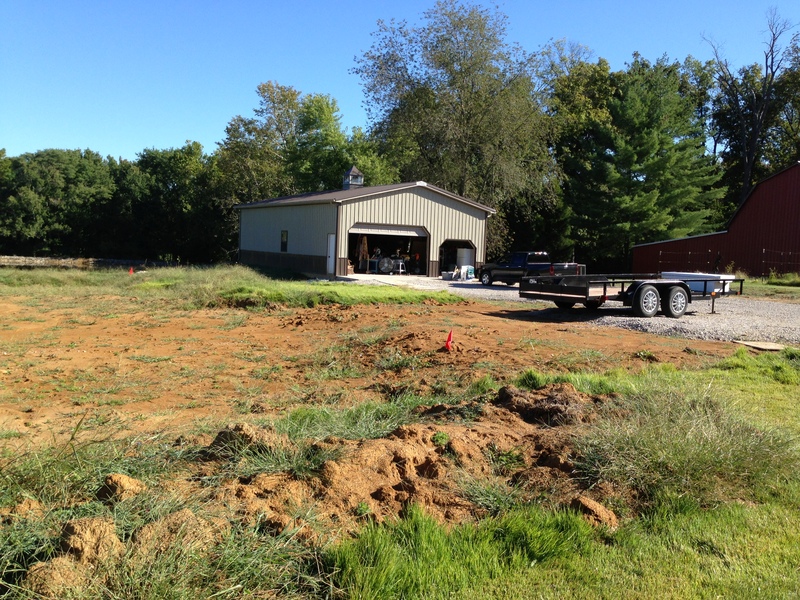 But, Jim did find us an excavator for the pole barn and our new driveway. They will start that on June 3 if we don’t have rain delays. 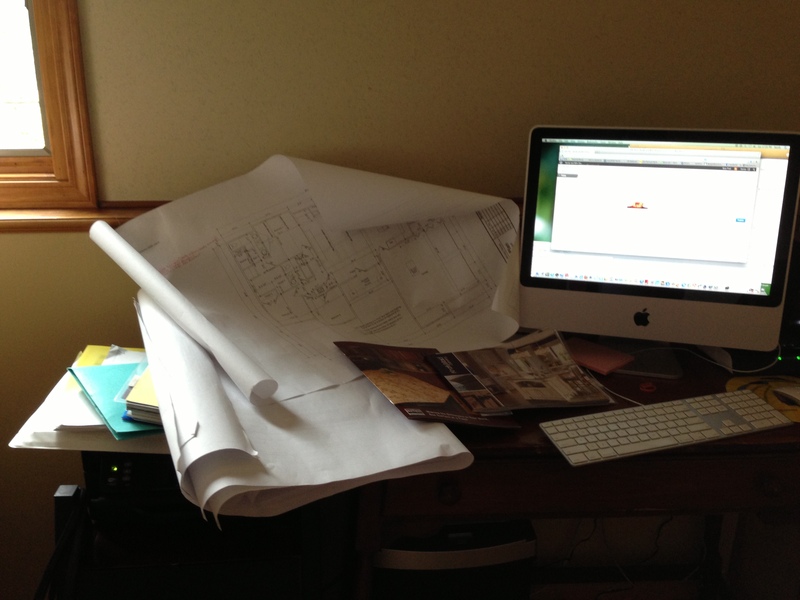 Even though we know we have to pack up this house, we had to finalize our new house plans and specification document. Jim wants to send out bids this week. Bill and I spent about 5 hours on that Thursday evening. We still had some gaps of a few items before we could complete the specs. So, we dedicated Friday to settling on bathroom cabinets/vanities; granite for kitchen and bathrooms; and what to do about a safe room. Jim called us several times on Friday before and after they left town for the holiday weekend. Before he left town he asked me to email him what we had for our spec document so far so he could read over it while he was out-of-town. After we had gotten home from our all day vendor shopping day and stops at Home Depot to get more packing boxes and a new mailbox for our new place and Staples to get reinforced tape, Jim called us and wanted to talk. He had a long list of items we needed to do or which we had to make decisions. 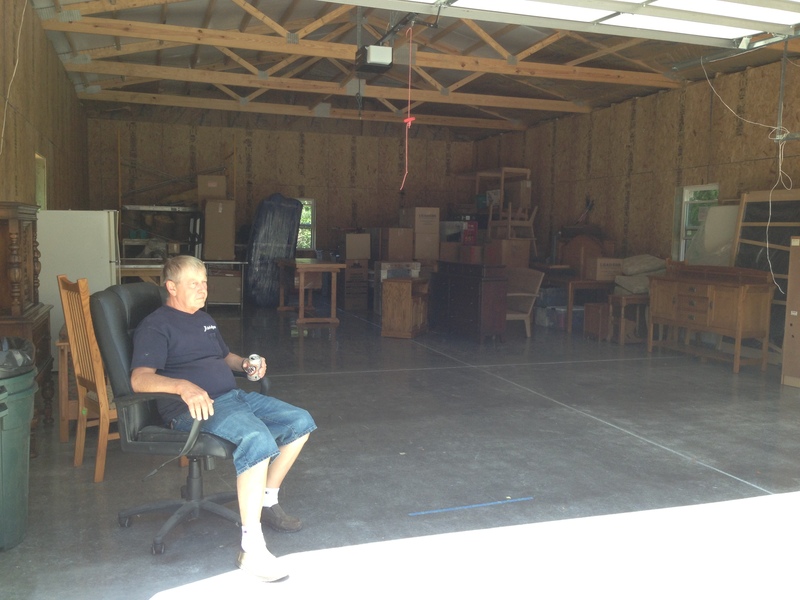 Jim was on the ball to get moving on our pole barn and house bids. Bill decided he wanted to take one load down to Jim and Jill’s over the holiday weekend. 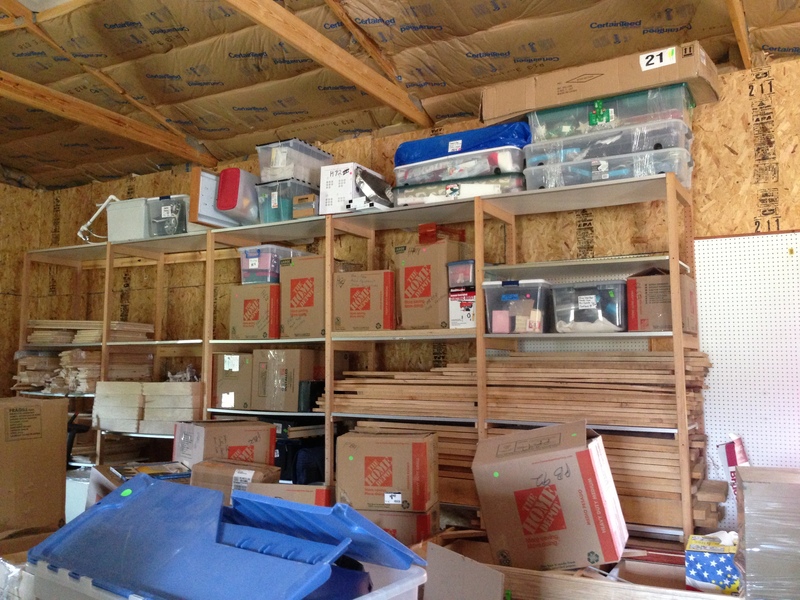 J&J said we could store some things in their garage. Bill & I decided we did not want the movers to move any of the new cabinets Bill built or any of the items we purchased for the new house (lights fixtures, ceiling fans, door hardware, etc.). 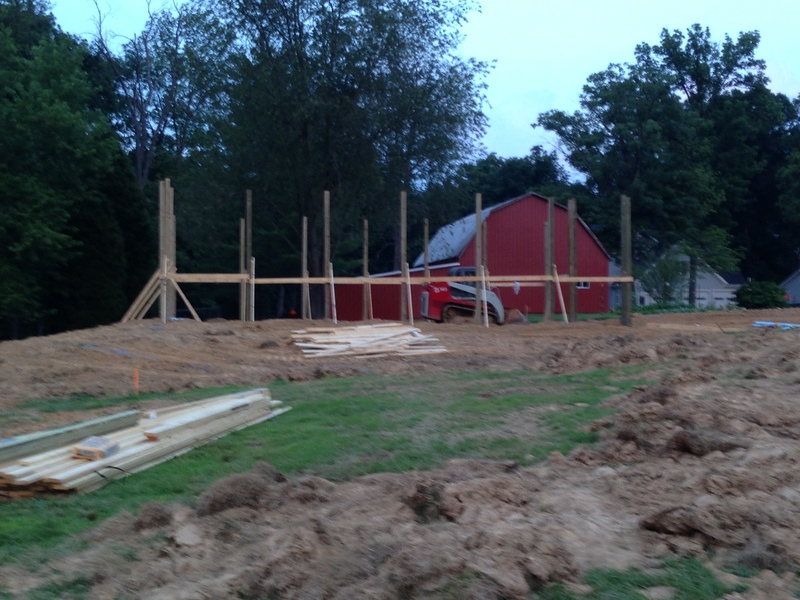 So, Bill and I worked a very long day Saturday in the pole barn. 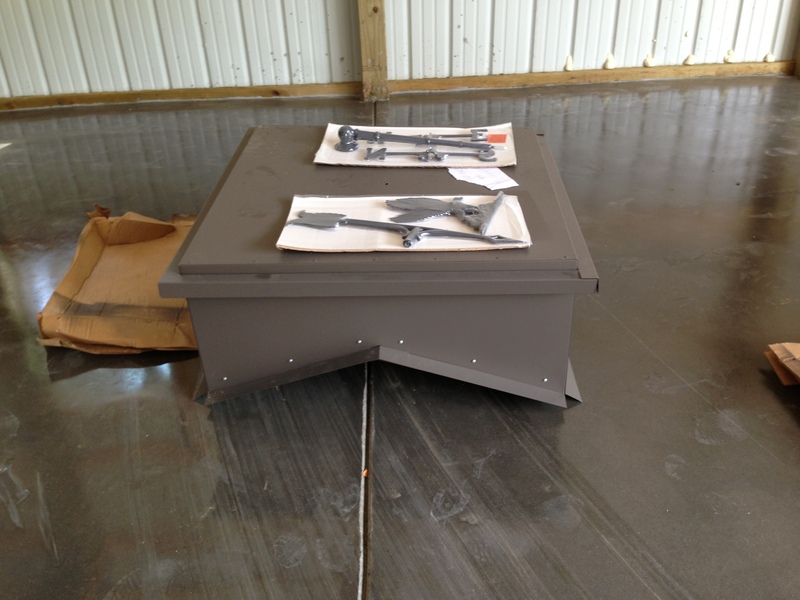 We dismantled, coded, and did some shrink wrapping of all the cabinets Bill had made. 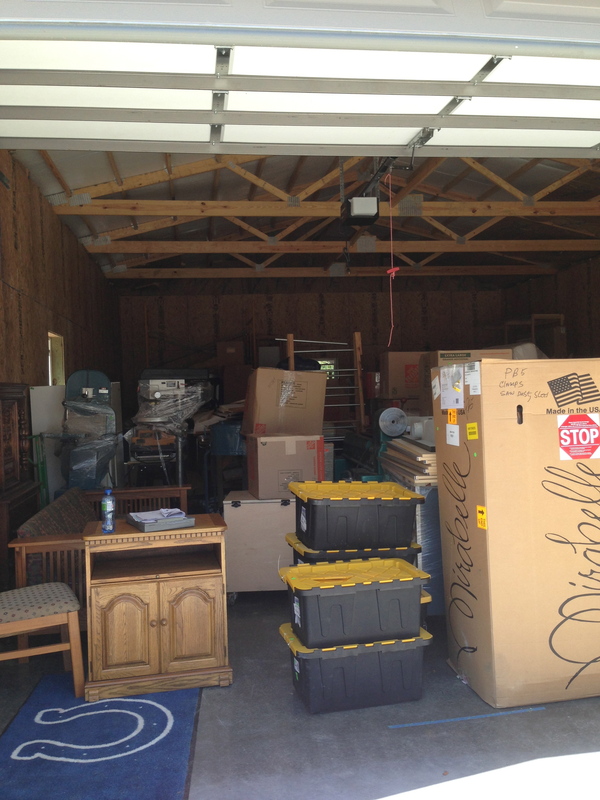 Then he wanted to move every thing we had stored in bins on one side of the storage area of the pole barn out into another area. 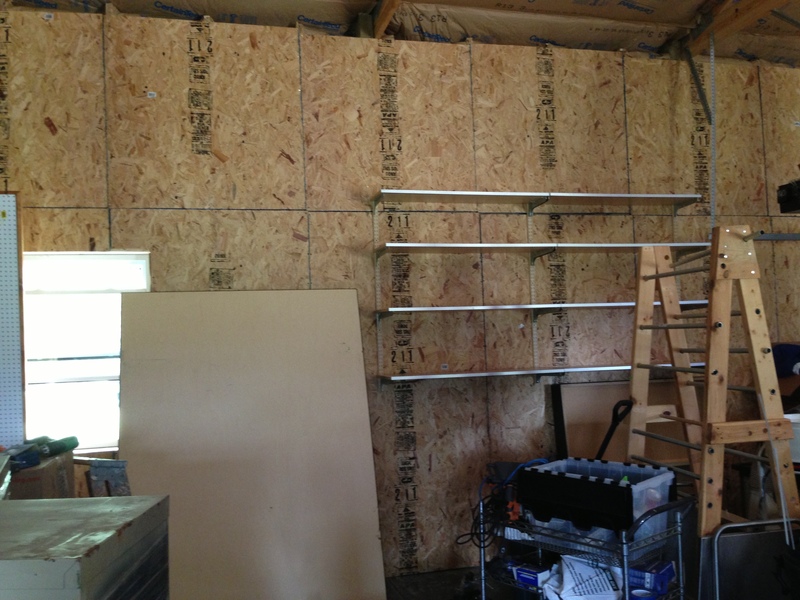 He wanted to dismantle a large section of storage shelves so he could take them down and put up in J&J’s garage. I told him my way of organizing is only to move things one time. 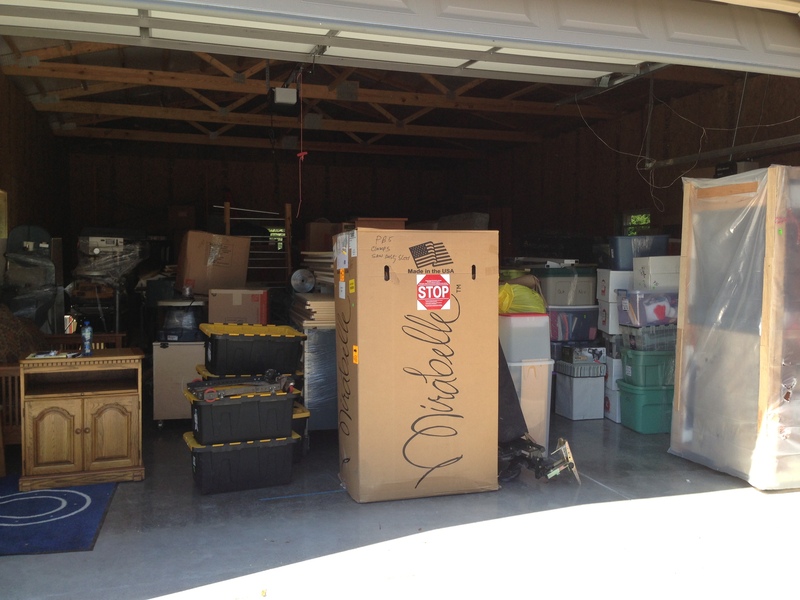 And, we needed to find a space where we could store the bins so the movers could get them. We cleared out a section of the pole barn and burned a lot of scrap wood. And, then we started to get out all those bins I had filled for almost two years. 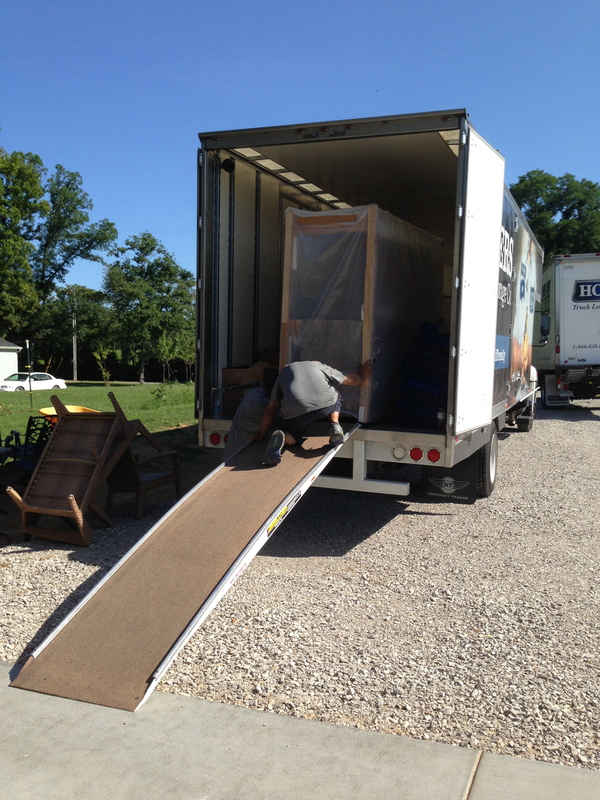 Here are some photos of all the crazy things we dismantled and packed on the trailer and truck yesterday. We were exhausted by the end of the day. Tylenol for me. Aleve for Bill. We both slept well last night. 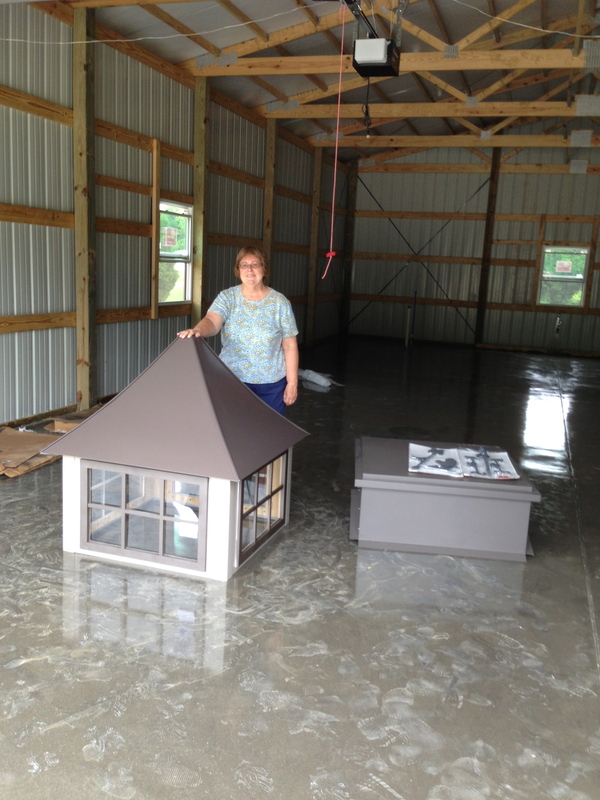 The plan was for Bill to drive down to J&J’s early this morning; unload the shelving units; install the shelving units; unload all the items from the trailer and truck and store on the shelves; dig a hole and install the mailbox; and then drive back home. But, that’s not what happened. Bill got ready to go and drove the truck out to the pole barn to hook up the trailer. When he cranked the trailer hitch to the truck the truck really started to sink down. Bill knew he was at the maximum weight to pull. He looked at me and said, I can’t do this! 😯 He said he felt he just could not afford to spend a whole day gone with so much to do around here. I think he had hit his panic mode. I could see it in his face. 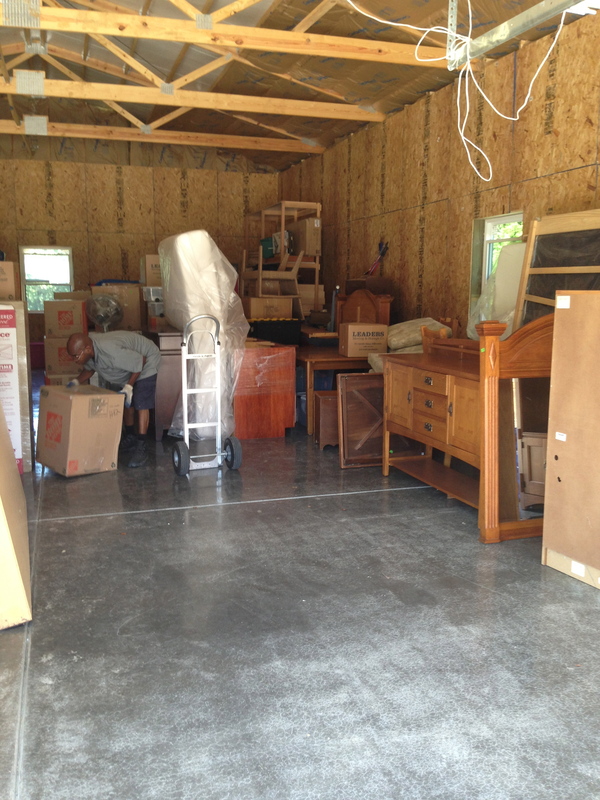 He said he wanted to rent a storage unit around here and store all the stuff he wanted to move himself into it. That way he could move it down to J&J’s a little at a time and without rushing it in what is now a 2 week period. He knew I didn’t want to rent a storage unit up here. 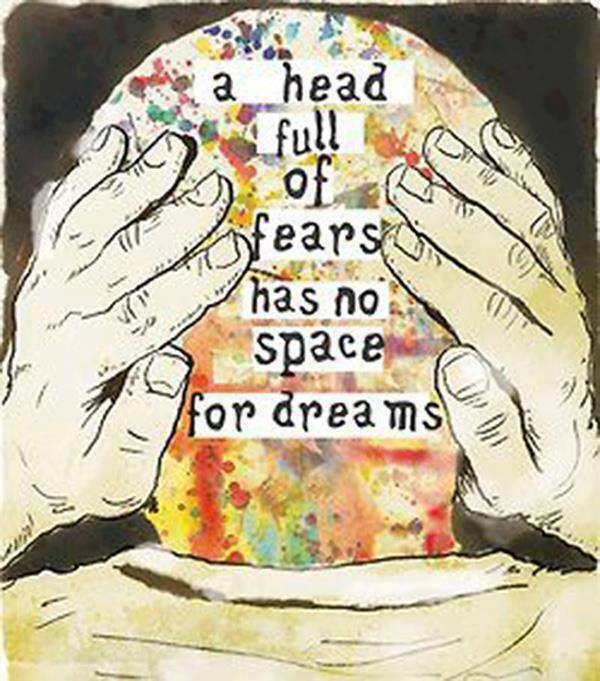 But, after thinking about it, it’s the best decision. We do not have time to travel over 3 hours both ways 4-5 times in the next two weeks. And, Bill is determined he will move certain things himself . . . period. Bill decided he needed to work on the electrical stuff today. So that is what he has worked on all day. I spent about 3-4 hours on the specification document for the new house and finished it. Yay!!! I emailed it to Jim. But, here is what my computer area looked like while I was working. I need to clean the house for the appraisal tomorrow, but found it difficult to clean when Bill was testing and turning off breakers. And, two of the boxes/switches he had to install were in the kitchen. Poor guy, he had a really tough time figuring out the wiring on those, but he finally did and they are done. While Bill was working inside on the electric, I cut the grass. It appears as I’m typing this that the outside boxes Bill is replacing are going a lot quicker than those inside ones. 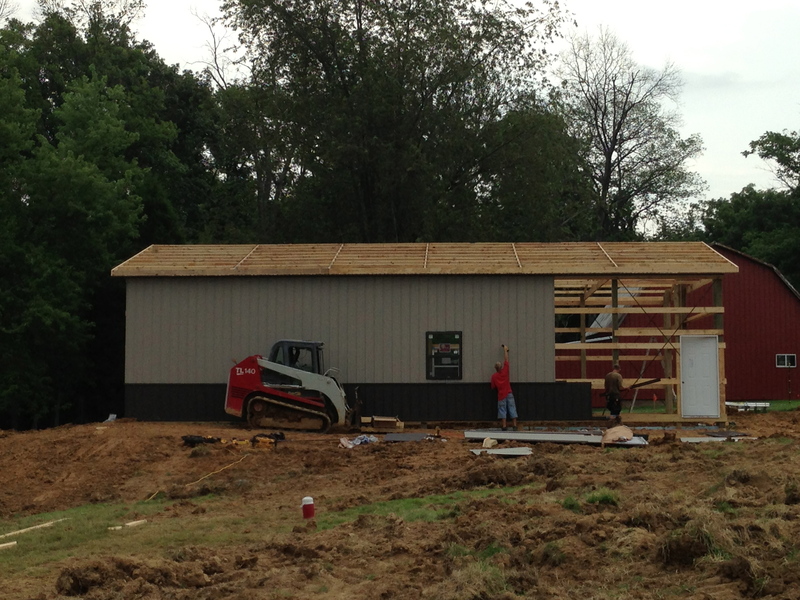 He has one more to do on the outside of the pole barn. Folks, that’s where we are. I’m procrastinating cleaning with this blog post. Let’s just say that I haven’t run the vacuum cleaner since our last showing! Goldie’s been happy, but I need to clean. We need the appraisal to match the offer price. I don’t want to even think about what we have to do if it doesn’t. Prayers are welcome!!! Next: You might not hear from me in a while if everything goes well. 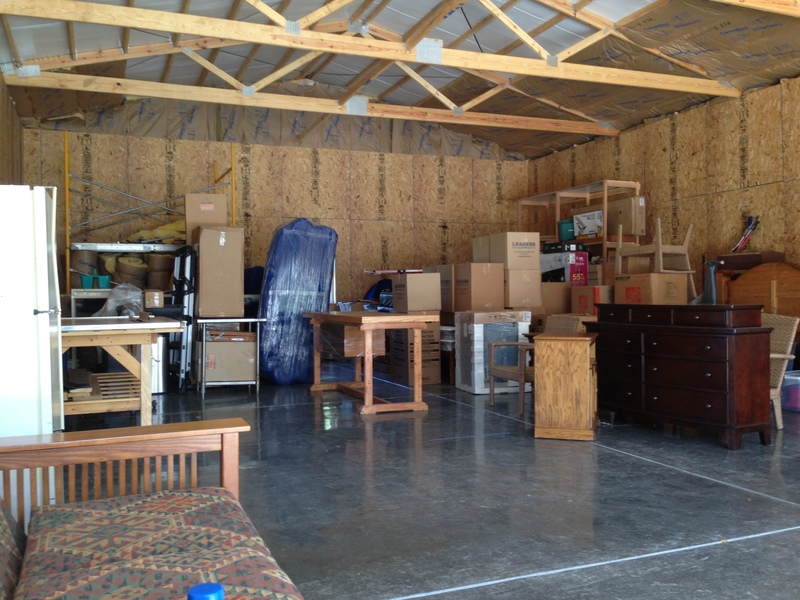 I’ll be so busy packing up what’s left in the house, outdoors, shed, and pole barn. June 10 is closer than I want to imagine.